Illustration for James Comey’s article on Medium’s yearly ‘Words That Matter‘, called ‘TRUTH‘. New York, 2018. 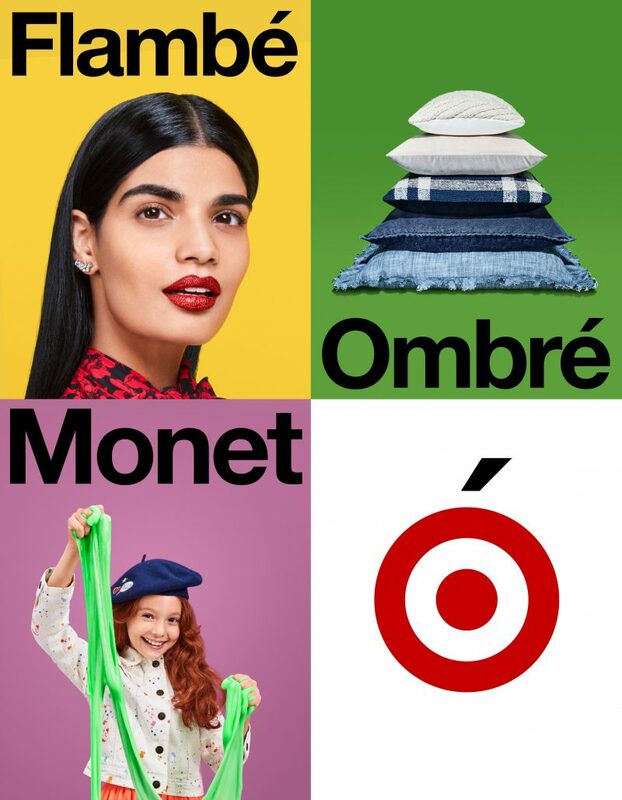 Campaign Design for Target’s Fall 2018 Season and seasons to come. The design embraces the unspoken; Target is pronounced Targét (Tar-zhay). 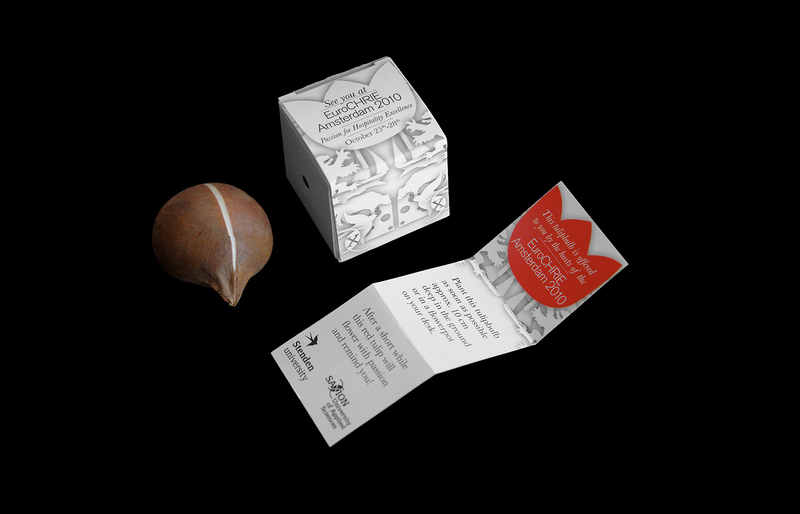 Straightforward image and word rhymes form the basis for the design. Designed at Mother, New York. 2018. 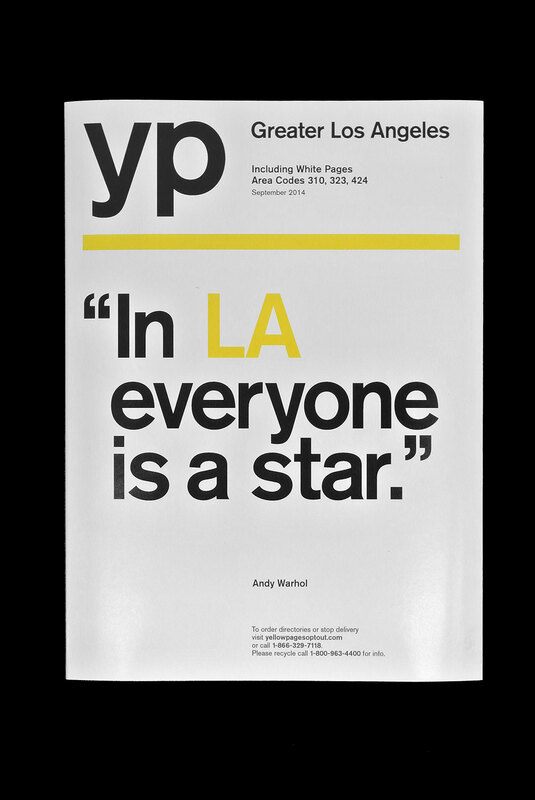 Designed with Enrique Mosqueda, Eli Park and Dennis Kung. Photography by LACEY. 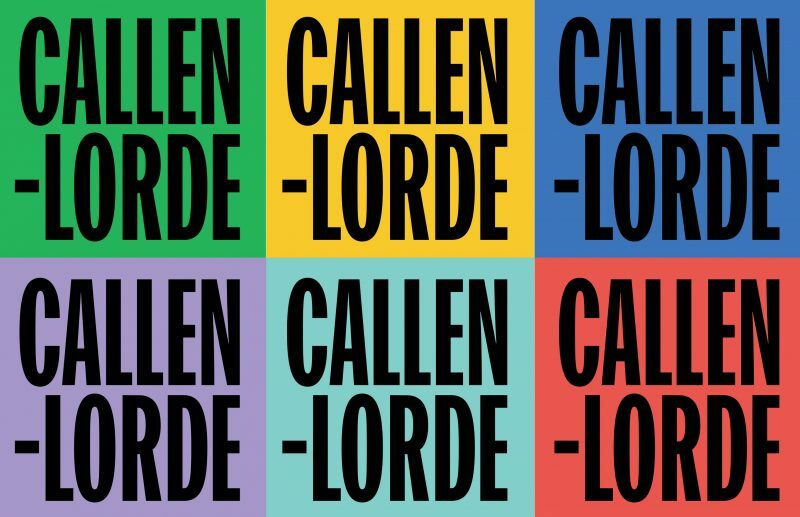 Logo and Identity design for Callen-Lorde, a primary care center, providing medical health care to the LGBTQ community in New York. Designed at Mother Design, NY, with Vanessa Hopkins, Morgan Light and Jane Jun. 2017 — 2018. Logo and Identity for ‘The Pregnancy Pause‘, a project by Mother New York, to help fill resume gaps for Mothers, with Claire & Emily, Vanessa Hopkins and Corinna Falusi. 2017. Adweek: Mother NY’s New Tool Helps Moms Return to the Workforce Post-Maternity Leave. 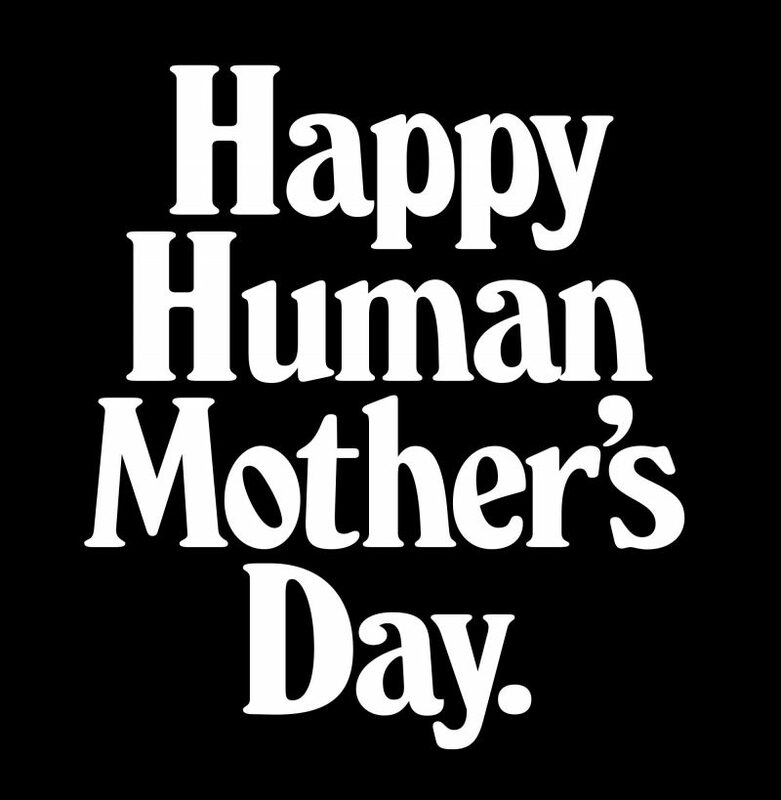 Typography and Design for Mother New York’s ‘Happy Human Mother’s Day’. Designed at Mother, New York. 2018. Designed with Alex Maleski and Alex Nassour. Adweek: Mother New York and Martin Starr wish human moms a happy Mother’s Day with nature videos. 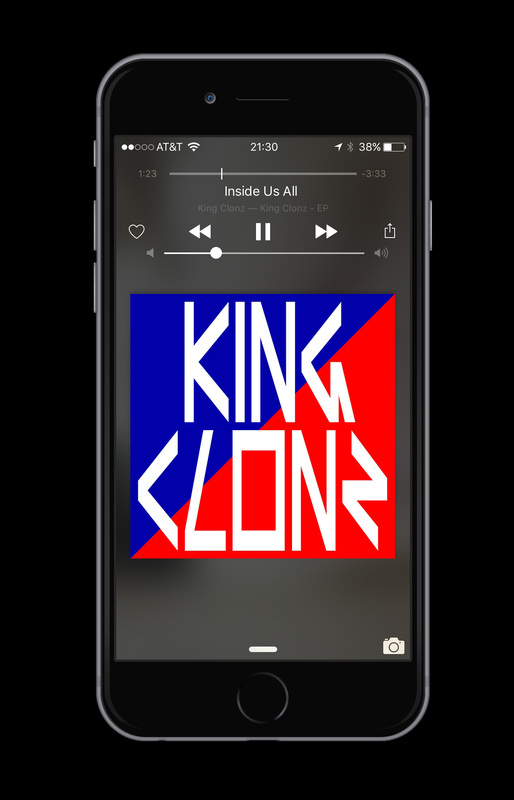 Album cover design for King Clonz, New York. 2018. Identity and Campaign Design for T-Mobile, USA. 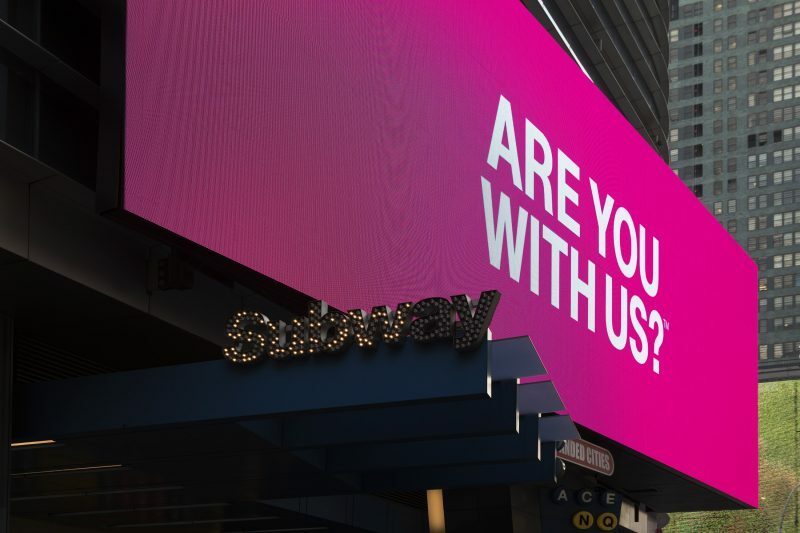 Reimagining T-Mobile, through the lens of a revolutionary spirit. Inclusive and rebellious. Designed at Mother, New York. 2018. Designed with Lauren van Aswegen, Demelza Rafferty and Daniel Jack Clark. 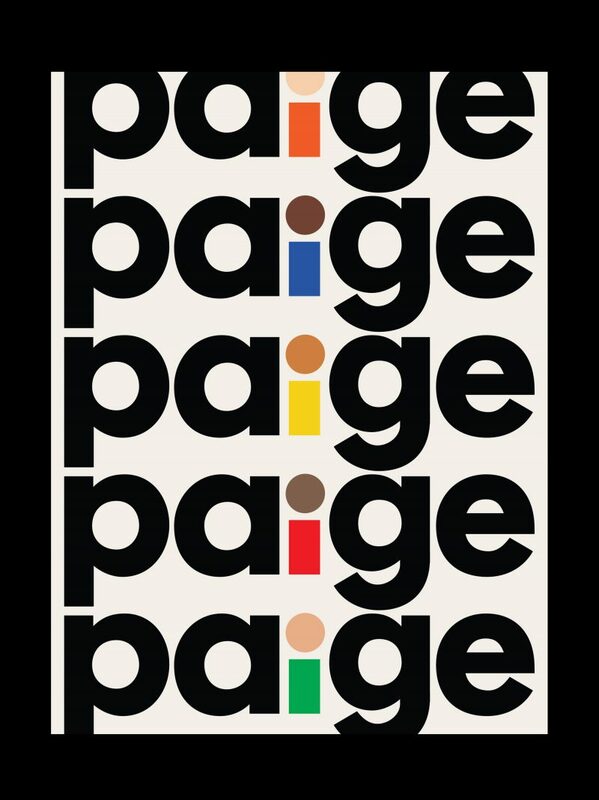 Logo design and visual identity for ‘Paige’, the Universal Omnicom IT Agency. Animations by Scott Brower and Ashley Cromwell. 2016 — 2017. 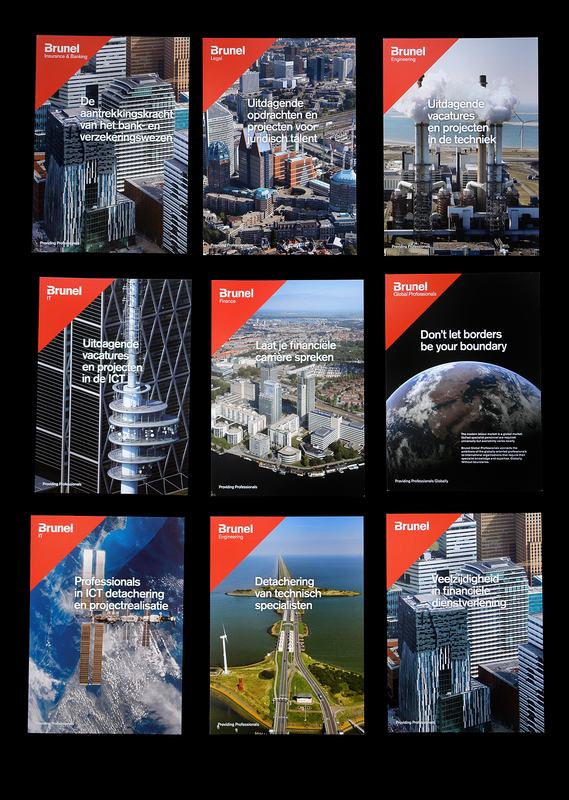 Logo design and visual identity for Interbrand, with Andy Payne, Kozue Yamada, Johnny Trinh and team. 2016 – 2017. Logo Design and Visual Identity at Interbrand with Mike Knaggs and Matt King for the rebrand of Laclede Natural Gas to Spire Natural Gas and Energy, St. Louis. 2016 — 2017. Published in Vivid! – The Allure of Color in Design and Pretty—Ugly Catalogue. Typography at Interbrand with Kurt Munger and Justin Ross Tolentino for Disney. 2016. Visual Identity with Mike Knaggs for Avis at Interbrand, New York. 2012. 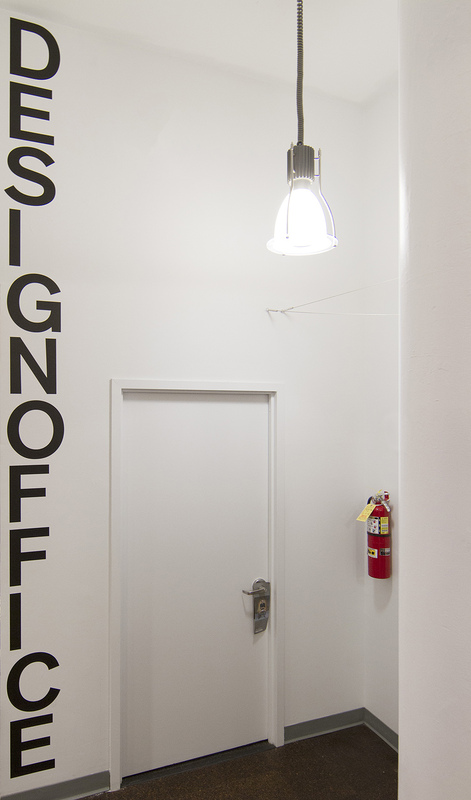 Signage for Interbrand, New York. With Kozue Yamada and Chris Campbell, New York. 2016. 24 Pantone color Poster wall design with Kozue Yamada for Interbrand’s Best Global Brands 2015 at the Whitney, New York. Whitney Images by Arnold Brower. 2015. Album cover design with Joseph Han for King Clonz, New York. 2015. 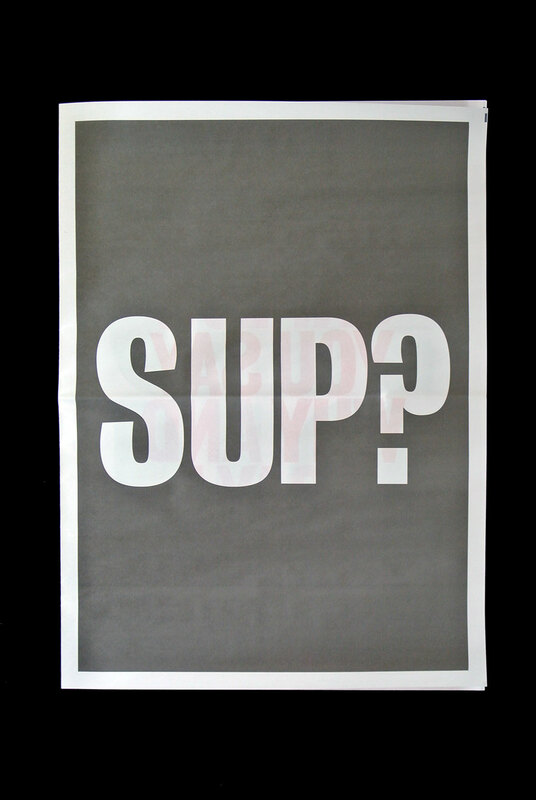 Posterdesigns with Joseph Han compiled in Newspaper format. 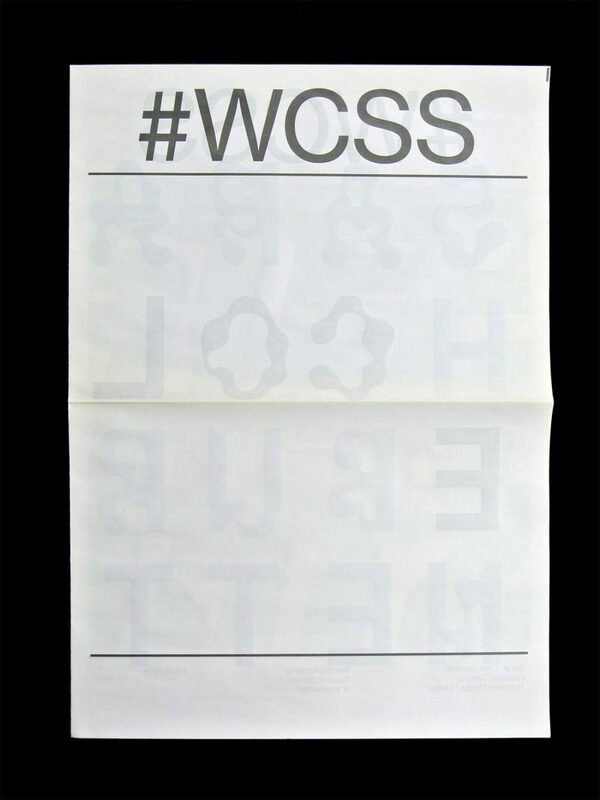 ‘WCSS’ is an acronym for the Speaker Series at Interbrand, New York. 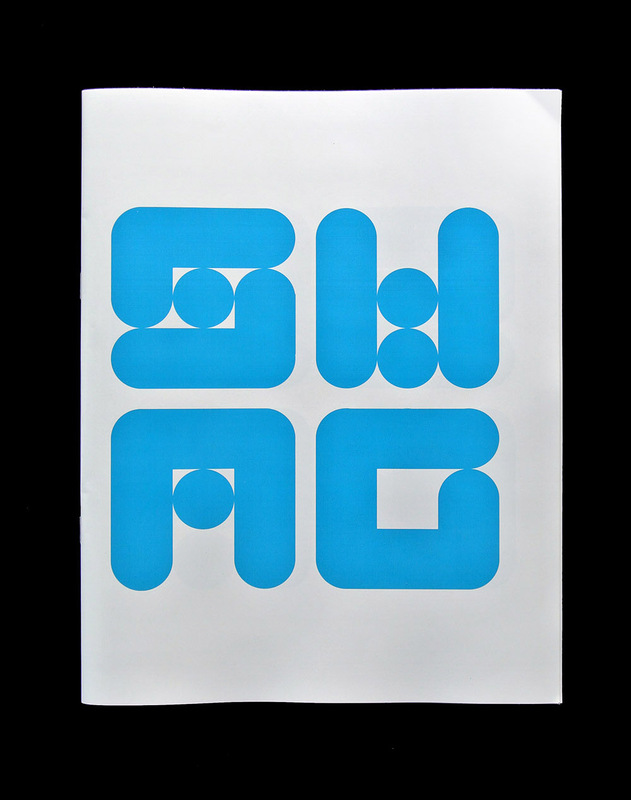 Simply headlined by ‘WCSS’, the typographic designs change from speaker to speaker. 2014 — 2015. 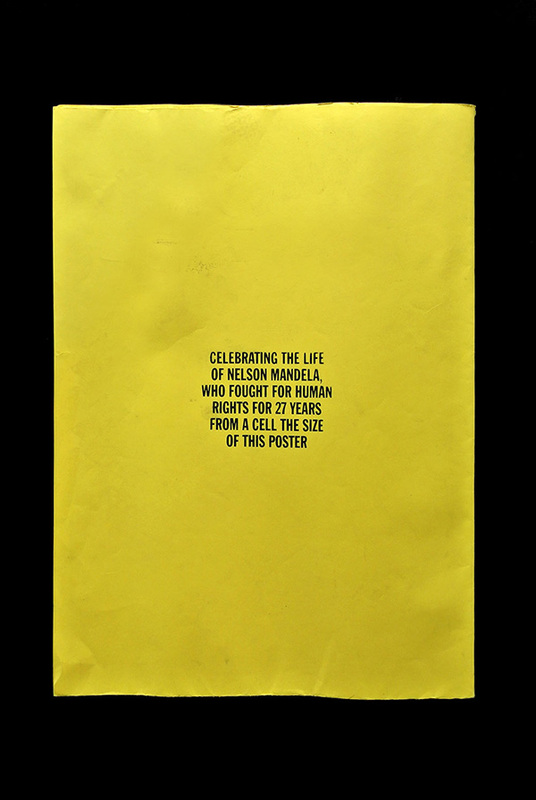 Nelson Mandela ‘Paper Prison’. Unfolding from A2 to 2.2 × 2.5 meter, the size of Mandela’s cell. 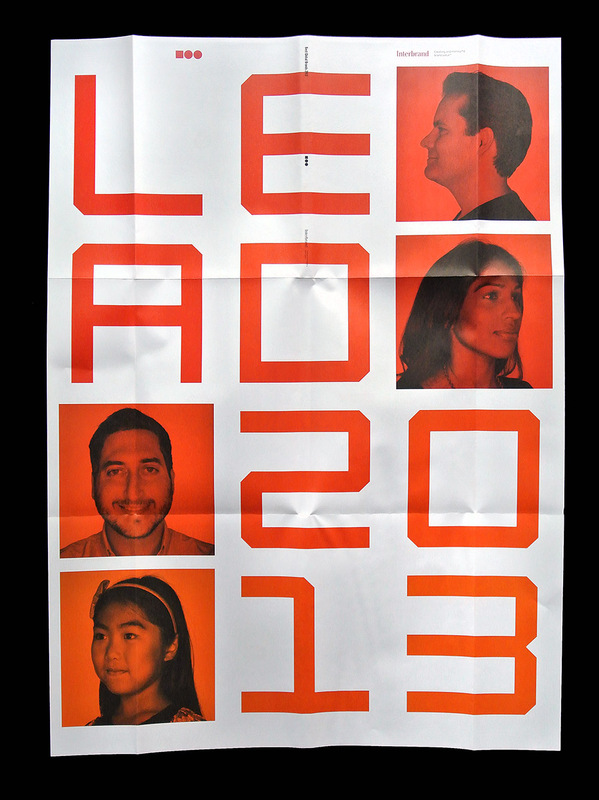 Posterdesign with Forest Young, Matt King, Annalisa van den Bergh and others at Interbrand, New York. 2014. Winner of a Cannes Gold Lion 2014. Visual Identity design with Kozue Yamada and Chris Campbell at Interbrand, for The Myseum of Toronto. NY & Toronto. 2015. Enhanced Stats and Financial Records provide the background in design in this Annual Report. Designed at G2K, Amsterdam. 2009. 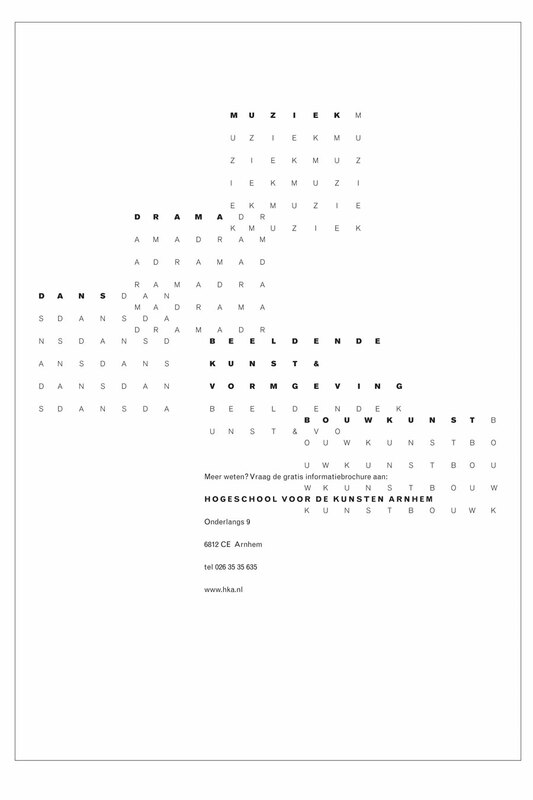 Best Designed Annual Report of The Netherlands 2009 (Best Verzorgd jaarverslag 2009). Red Dot Design Award 2010. Logo Design / Typography with Jessica Staley and Craig Stout at Interbrand, New York. 2014. 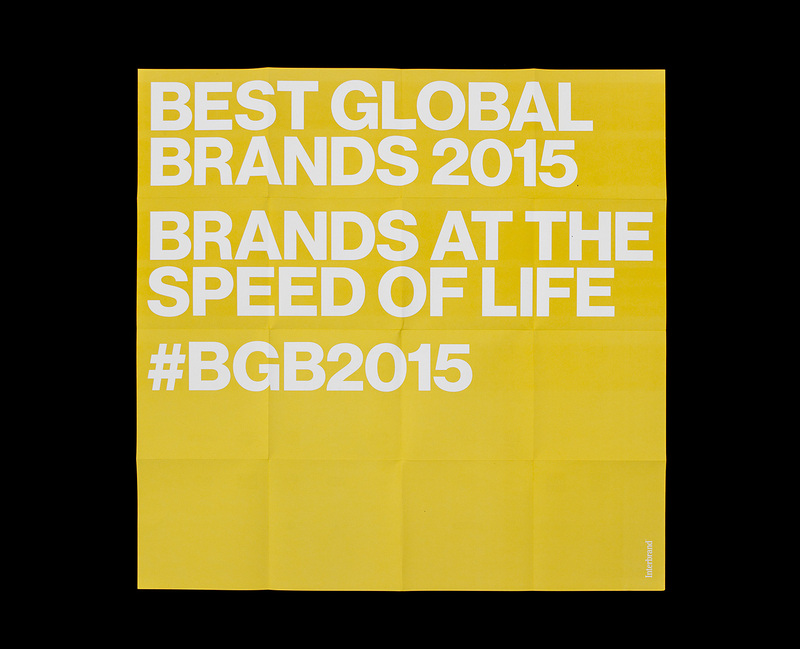 Visual Identity with Forest Young and Joseph Han for Interbrand’s Best Global Brands 2014 at Interbrand, New York. 2014. 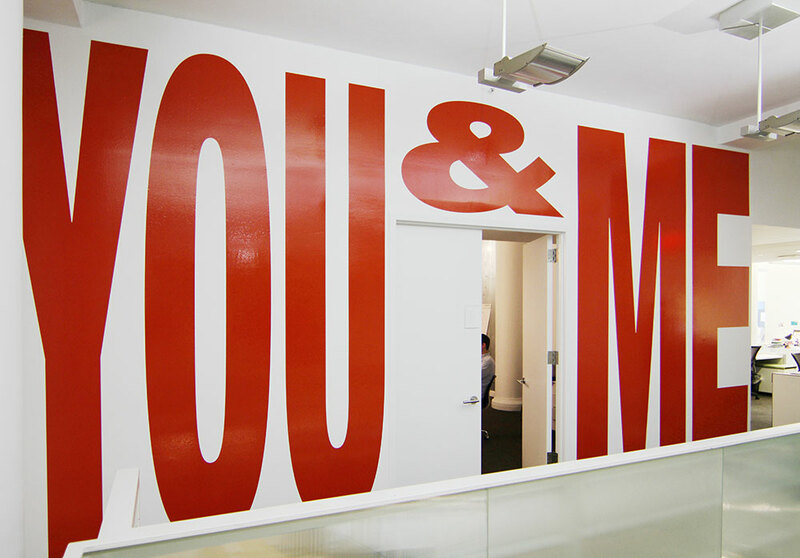 ‘You & Me’ Walldesign with Joseph Han at Interbrand, New York. 2014. Book design with Forest Young and Kathy Keen for YP at Interbrand, New York. 2014. Newspaper compilation of designs featured on my personal blog ‘webecomelegend.tumblr.com‘. 375 × 520mm. Edition of 5. 2013. 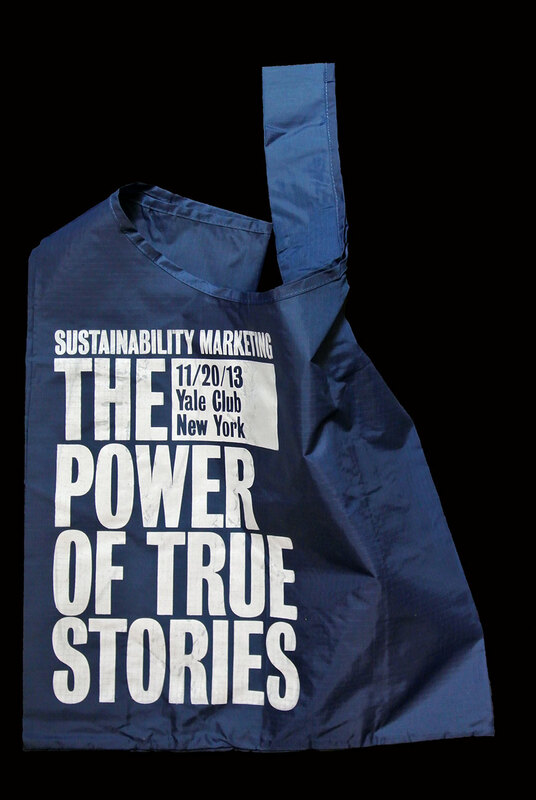 Eventdesign with Joseph Han at Interbrand, New York, for ‘The Power Of True Stories’ Hosted by Yale and Interbrand. The design focusses around the idea of re-using existing material, reducing waste. #SMCstories. 2013. Visual Identity with Forest Young for Interbrand’s Best Global Brands 2013 at Interbrand, New York. Portrait Photography & Location Shots by Nao Okawa. 2013. 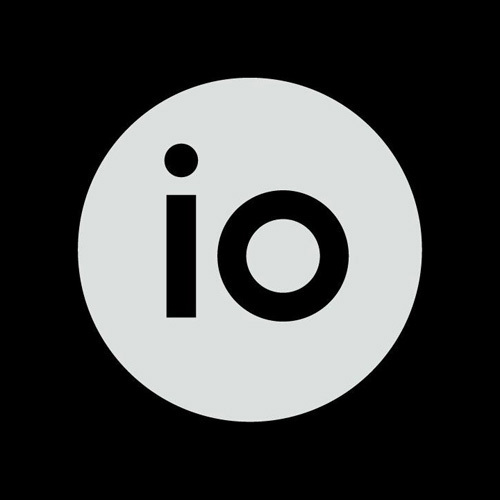 Visual Identity with Alan Roll for IO at Interbrand, New York. 2011 — 12. 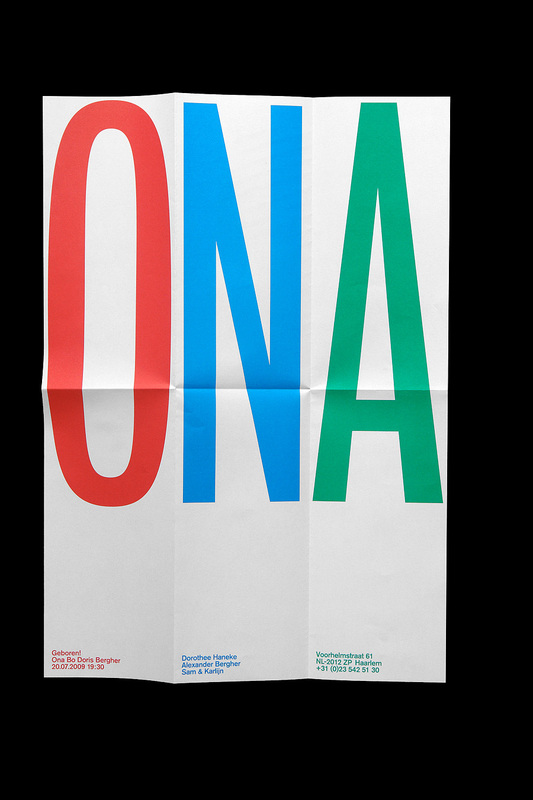 Visual Identity with Joseph Han for NDV. 2013. 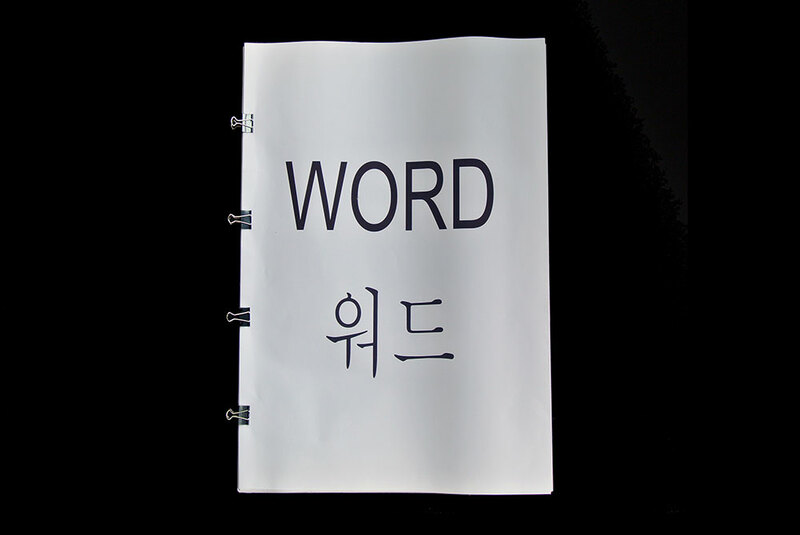 A bookproject with Joseph Han, designed within the limits of MS Word. 2013. UI Design and Logo design with Gon Zifroni for Cult. 2011 — 12. Visual Identity for Arenson NY. 2011. 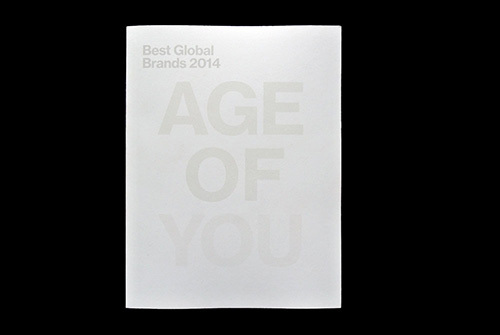 Typeface design at Interbrand, New York, for the occasion of ‘Best Global Brands 2013’. Visual Identity with Forest Young for Interbrand’s Best Global Brands at Interbrand, New York. 2012. Visual Identity with Forest Young for SeriousFun at Interbrand, New York. 2012. Type design with Forest Young at Interbrand, New York. 2013. 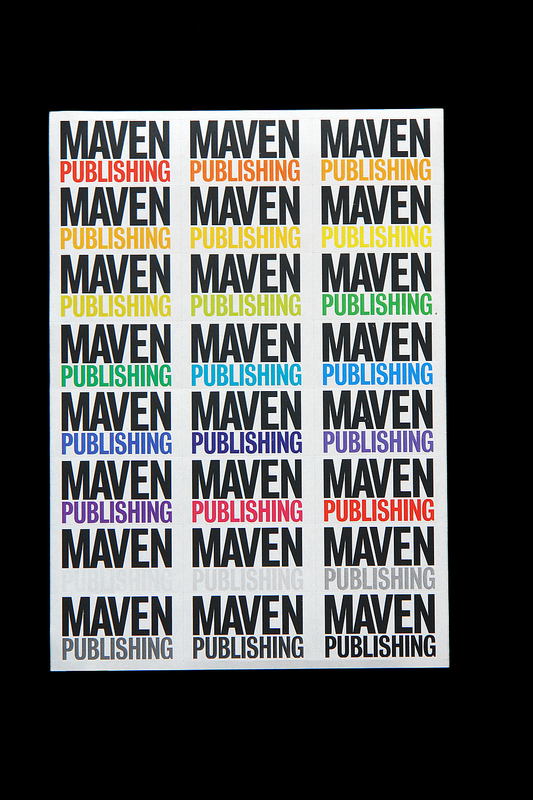 Bookdesign as part of the Visual Identity for Maven Publishing. Designed at G2K, Amsterdam. 2010 — 2011. How Is The Internet Changing The Way You Think? / Hoe verandert internet je manier van denken? Bookdesign as part of the Visual Identity for Maven Publishing. Designed at G2K, Amsterdam. 2010/2011. How is the internet changing the way you think? That is one of the dominant questions of our time, one which affects almost every aspect of our life and future. It’s what John Brockman, publisher of Edge.org, posed to more than 150 of the world’s most influential minds. Brilliant, farsighted, and fascinating, How Is the Internet Changing the Way You Think? 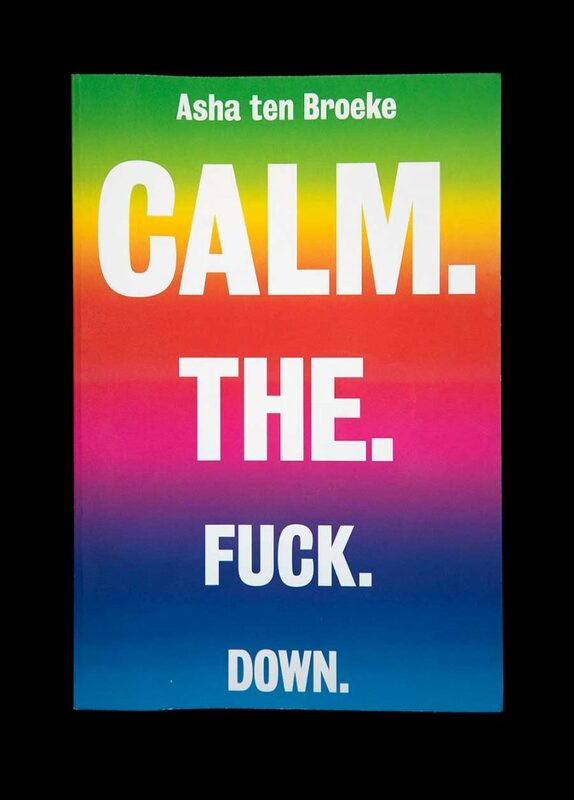 is an essential guide to the Net-based world. 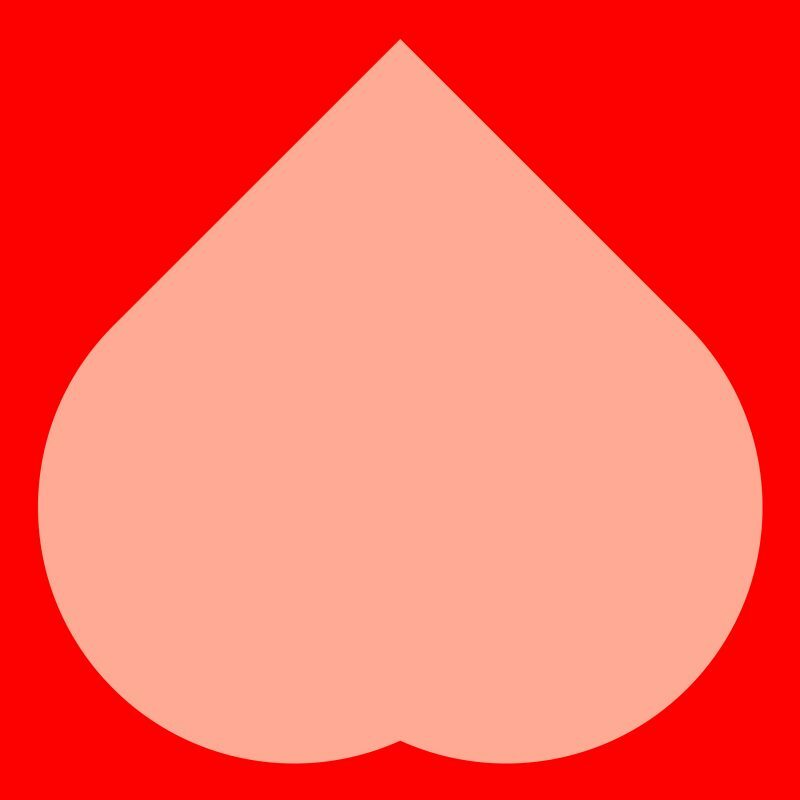 Red Dot category ‘Corporate Design’. 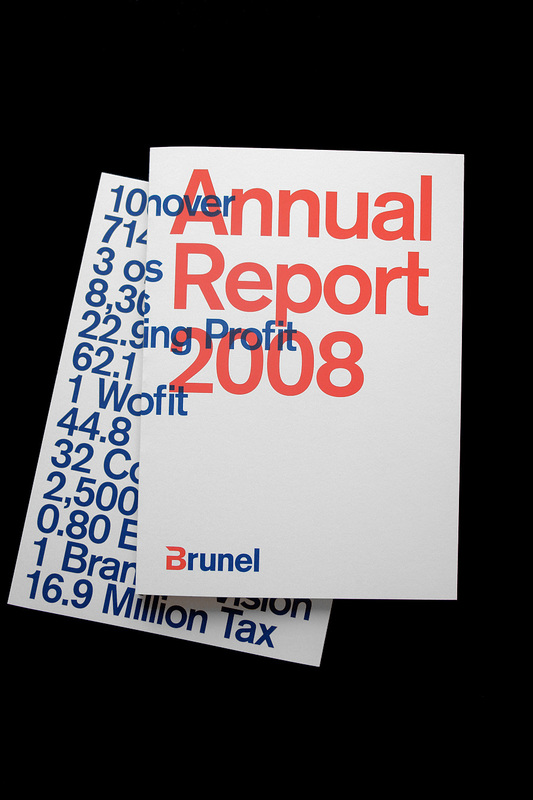 Brunel Red Dot category ‘Annual Report’. 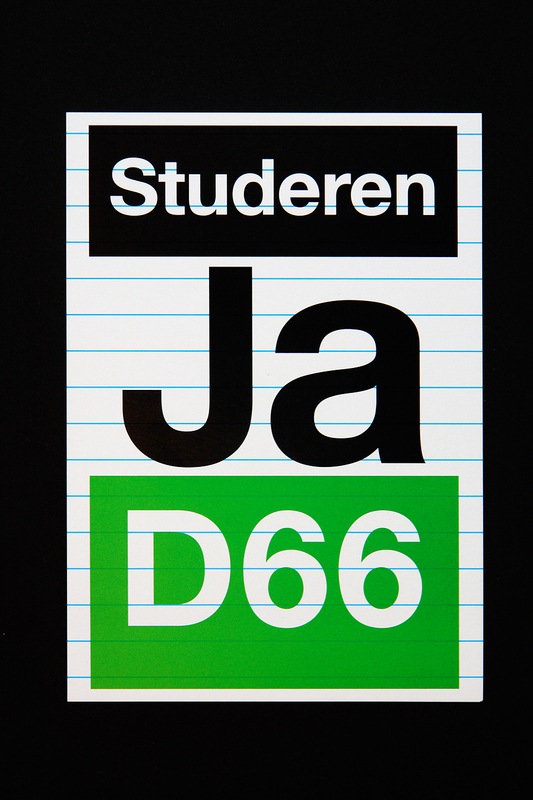 And D66 Posters Red Dot category ‘Best of the best’. Research on Public Space. With advisor Daniel van der Velden (metahaven) at the Jan van Eyck Academy. With fellow researchers Katja Gretzinger, Gon Zifroni and Matteo Poli. Logo Parc investigates the political and economical impacts on and through design in the new business district ‘Zuidas’ in Amsterdam. With placing the real space into a virtual game-environment we created a ‘clone’-space in which we were able to experiment with the aesthetic material found in situ. 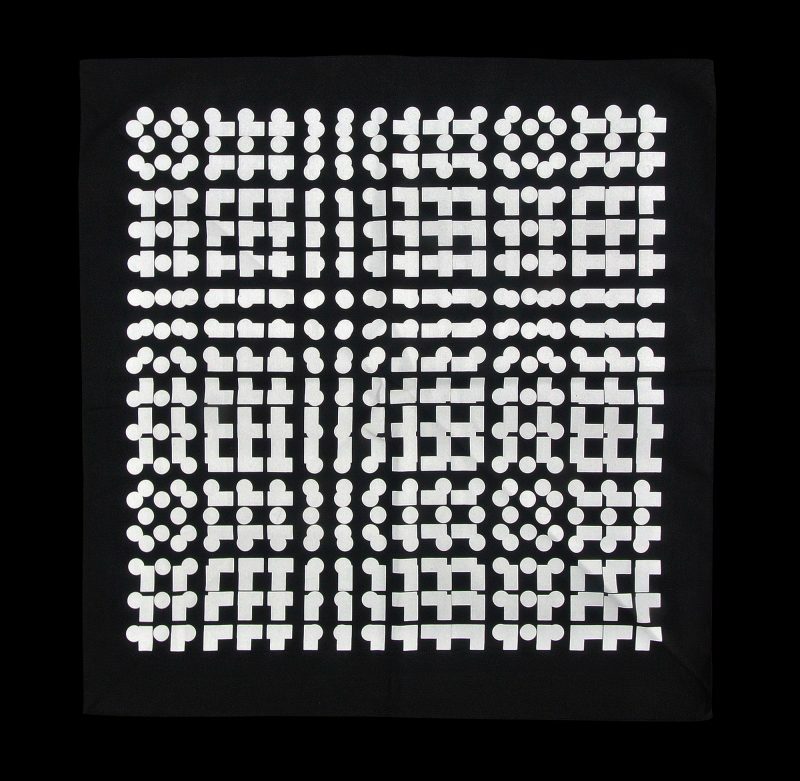 Personal impressions and the found material shaped the symbolic gestures in the virtual space. The space works as a discoursive space, which allows a critical reflection on current symptoms of post-modern city-planning. Hybridity of the Post-Public Space in Open!. 2006 — 07. Bookdesign at the Jan van Eyck, Maastricht. 2007. 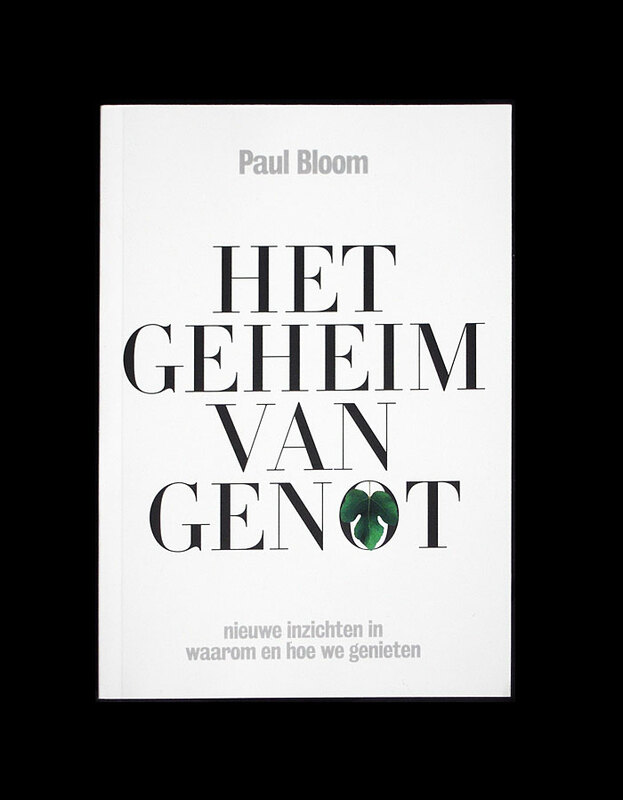 Bookdesign (Dans Met Kans / Dance With Chance) at G2K, Amsterdam, as part of the Visual Identity for Maven Publishing. 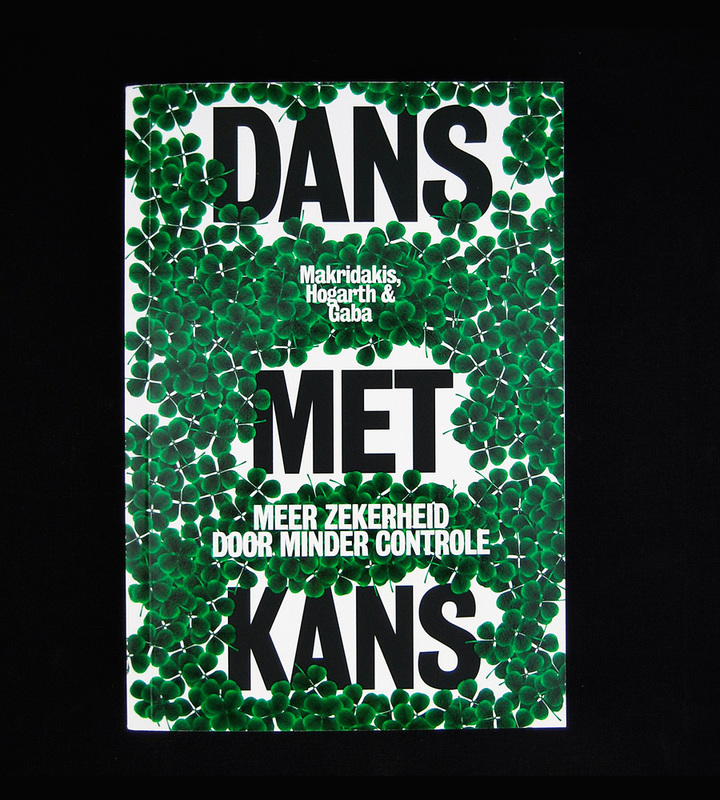 A field of clover-fours covers the front of this book about ‘Making Luck Work for You’. 2010. 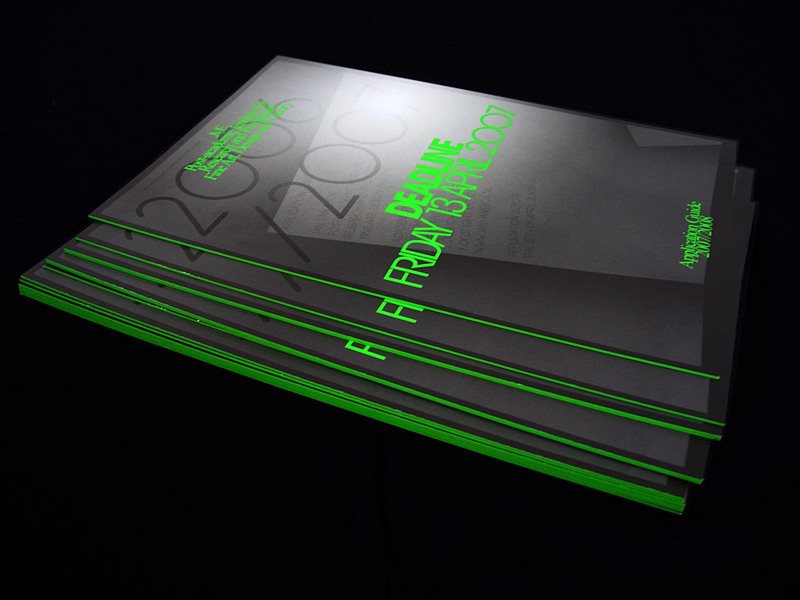 Catalogue design at G2K, Amsterdam. 2010. Fall 2010 releases Maven Publishing. 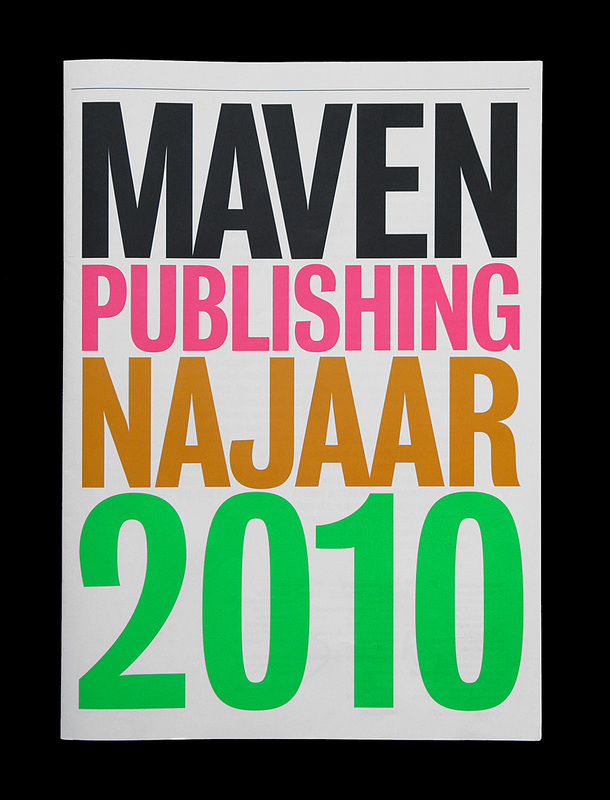 Bookdesign as part of the Visual Identity for Maven Publishing at G2K, Amsterdam. 2011. 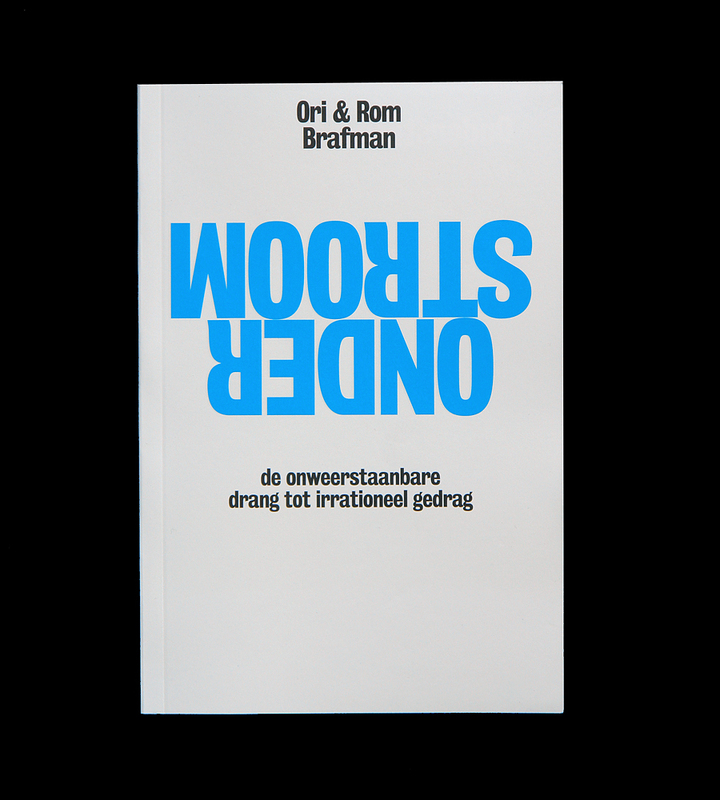 The Brafman brothers look at sway, the submerged mental drives that undermine rational action, from the desire to avoid loss to a failure to consider all the evidence or to perceive a person or situation beyond the initial impression and the reluctance to alter a plan that isn’t working. All the design-work for Maven has been awarded with a ‘Red Dot Design Award 2010’. Bookdesign at G2K, Amsterdam. 2009. 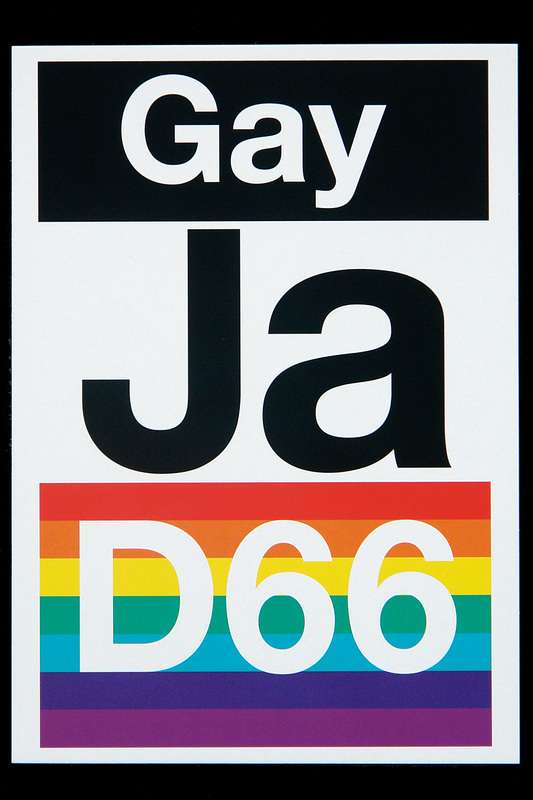 Campaign design at G2K, Amsterdam. 2010. 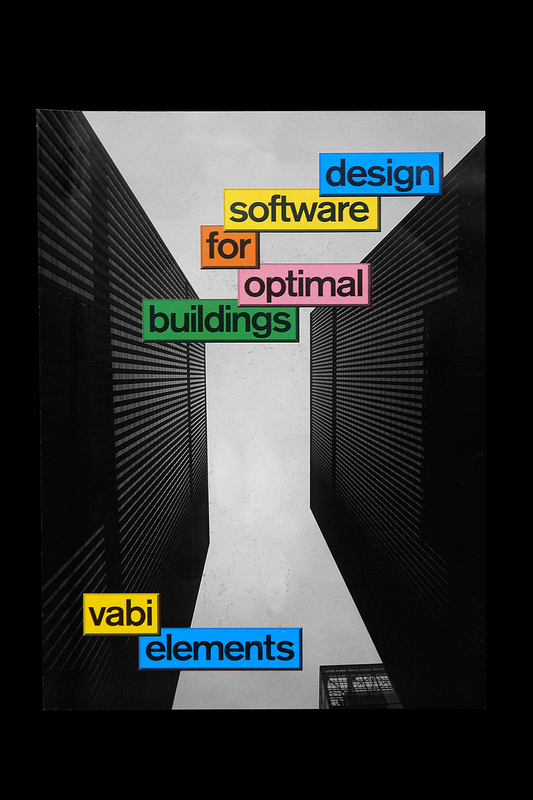 Vabi software assists architects and engineers on calculations in architectural models and installation technique. ‘Building blocks’, a metaphor for the way the interface of their software functions and actual buildings are constructed was the keyword in design. 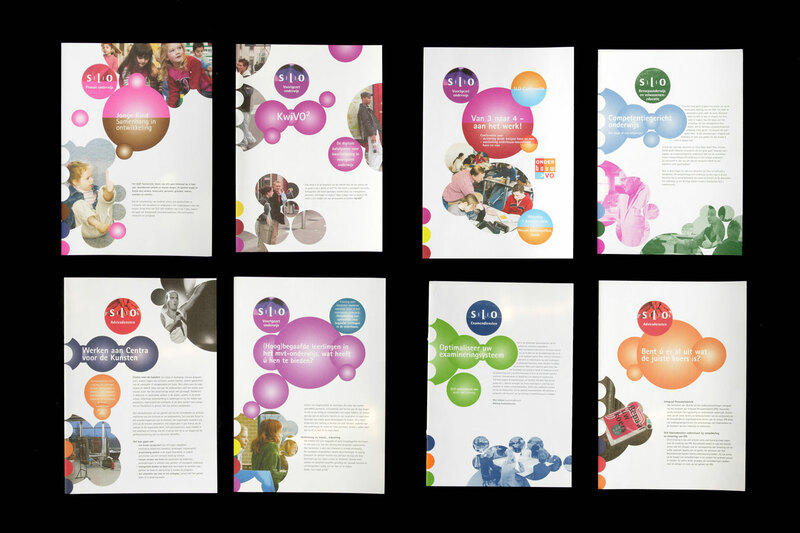 Event-Identity for The European Council on Hotel, Restaurant & Institutional Education, designed at G2K, Amsterdam. 2010. The Hospitality & Tourism educators. Welkom to Amsterdam! 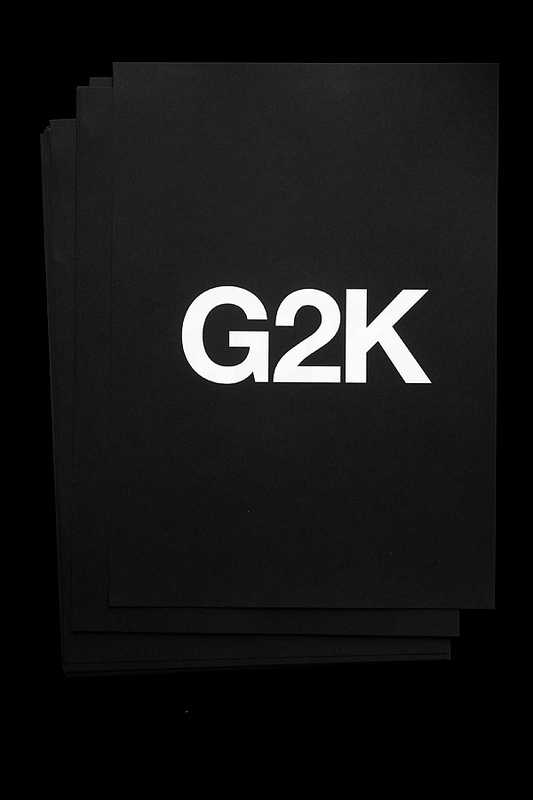 Brochure-design for G2K on Branding and Visual Identity, designed at G2K, Amsterdam. 2010/2011. Your Visual Identity is a first meet and greet. 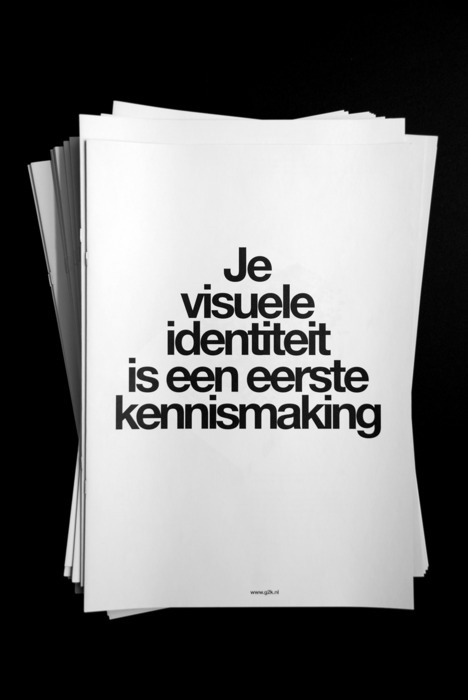 Your Visual Identity shows who You are. Your Visual Identity Enriches. Your Visual Identity is No Logo. Your Visual Identity is a Result. Your Visual Identity is Your Future. Bookdesign at G2K, Amsterdam. 2009. 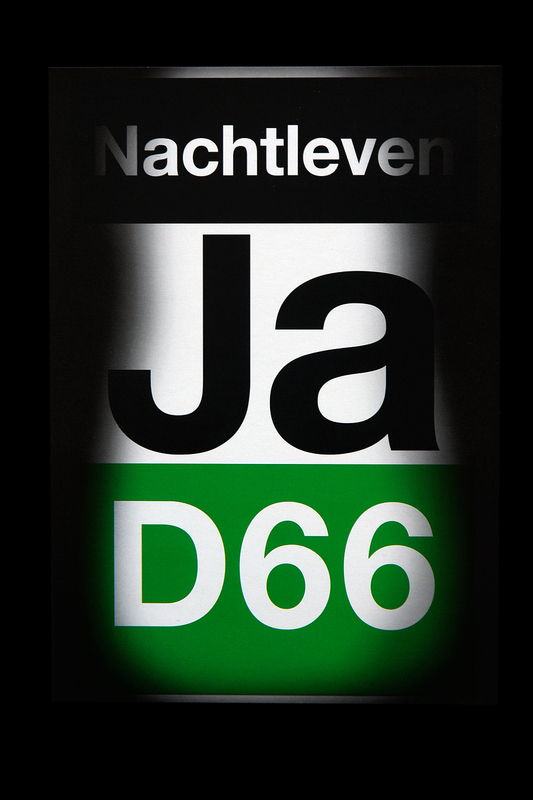 A present to those who attended the Dutch Democratic Party D66 brainstorm-dinners. Their names decorate the exterior of the publication. 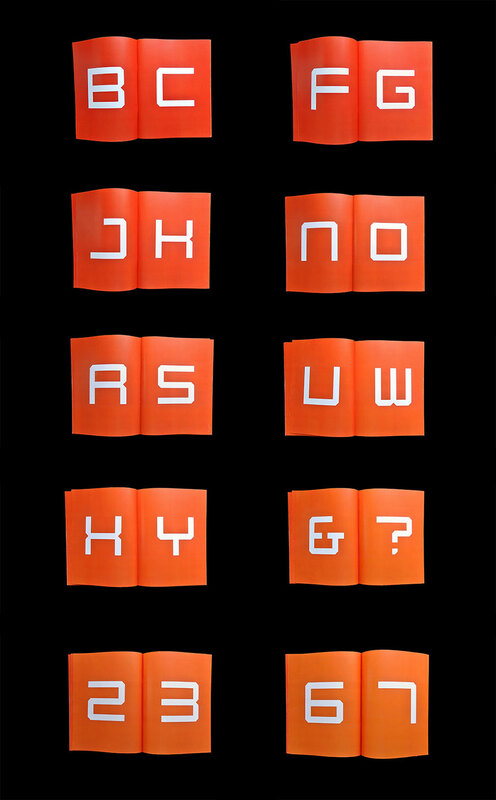 Bookdesign at G2K, Amsterdam. 2010. As part of the Visual Identity for Maven Publishing. 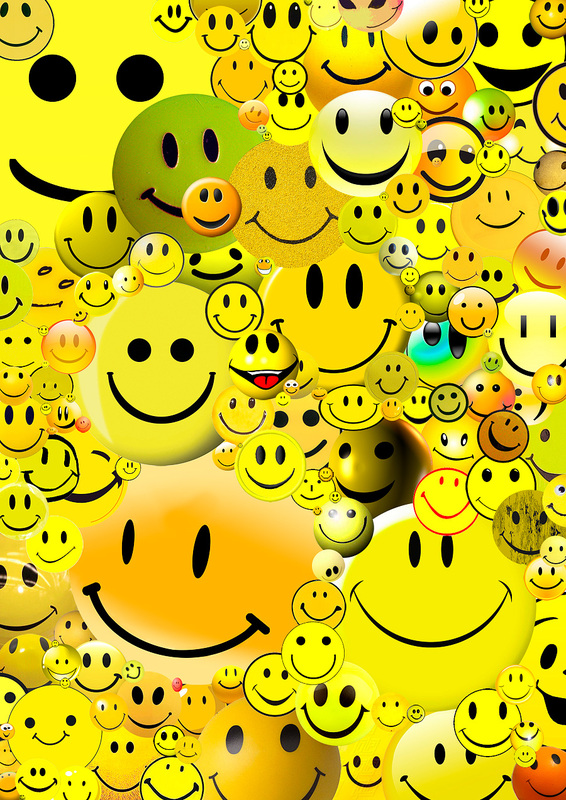 How to Change Mass Behaviour by Harnessing Our True Nature. By Mark Earls. All the design-work for Maven has been awarded with a ‘Red Dot Design Award 2010’. Designed at G2K, Amsterdam. 2010. Spring 2010 releases Maven Publishing. Visual identity at G2K, Amsterdam. 2007/2008. The largest chain of car-repair-shops in Europe. 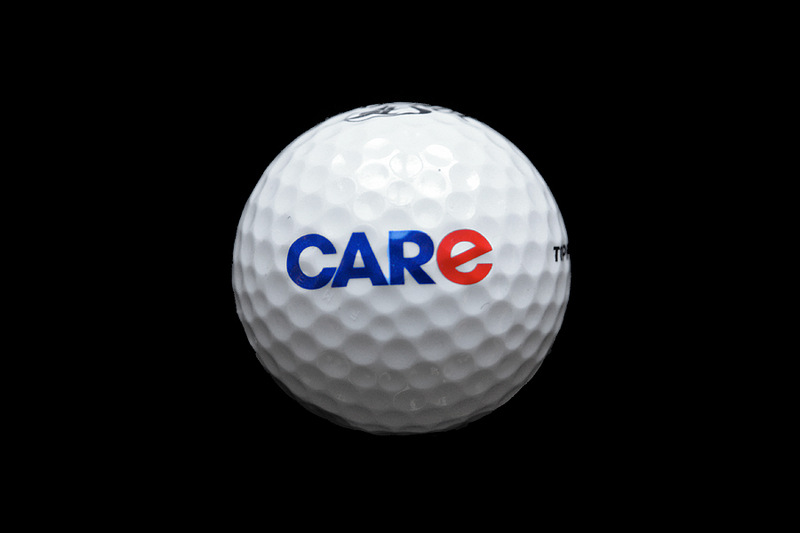 The ‘e’ makes the subtle distinction between car and care. Visual identity at G2K, Amsterdam. 2009. 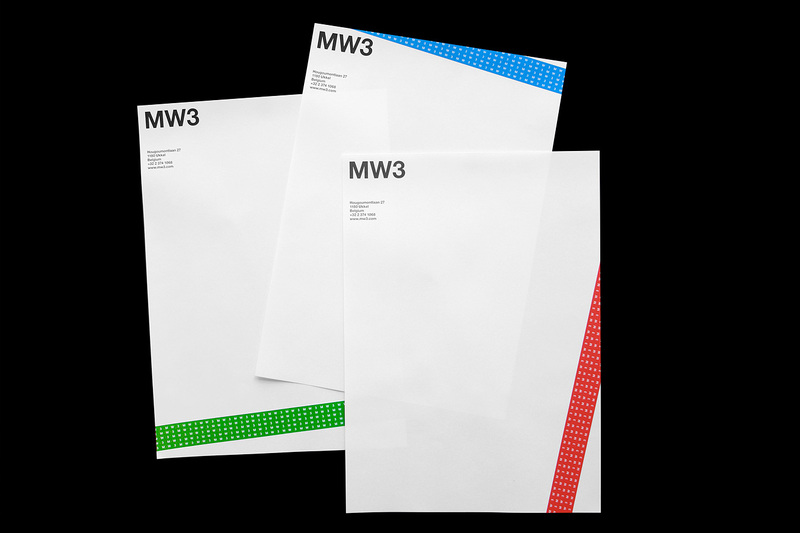 MW3 founded by a ‘wealthy’ collective of men, aims for providing a safe webinterface, when one deals business outside the office. The tickertape which covers all the stationary, repeats MW3. Visual identity at G2K, Amsterdam. 2008/2009. In collaboration with Laura Hirt. 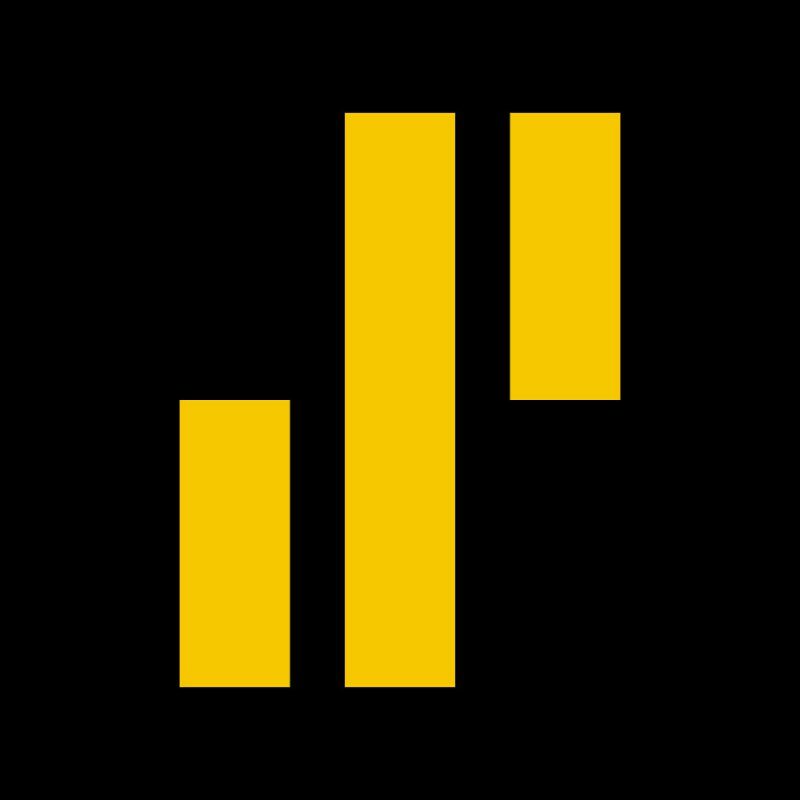 Zwind operates in the public arena; creating local projects for social issues. 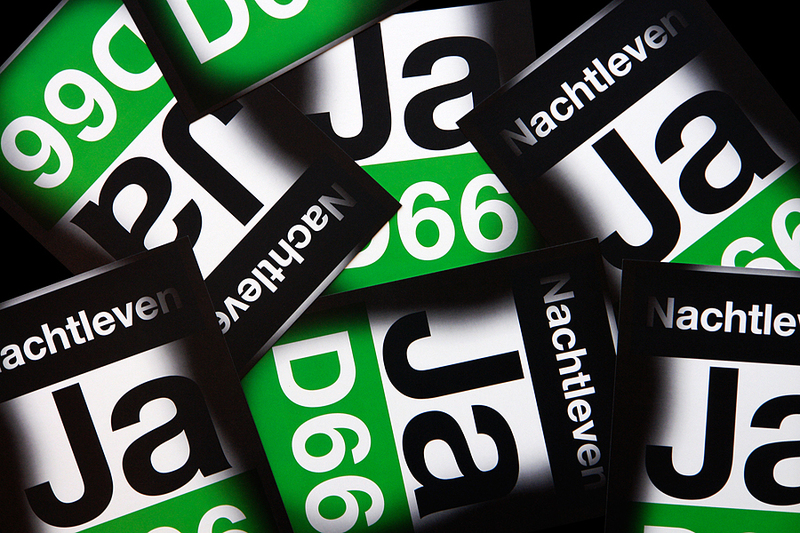 Visual Identity at G2K, Amsterdam, for Joep Moonen, a small real-estate dealer. ‘It’s… JOEP!’. 2008. 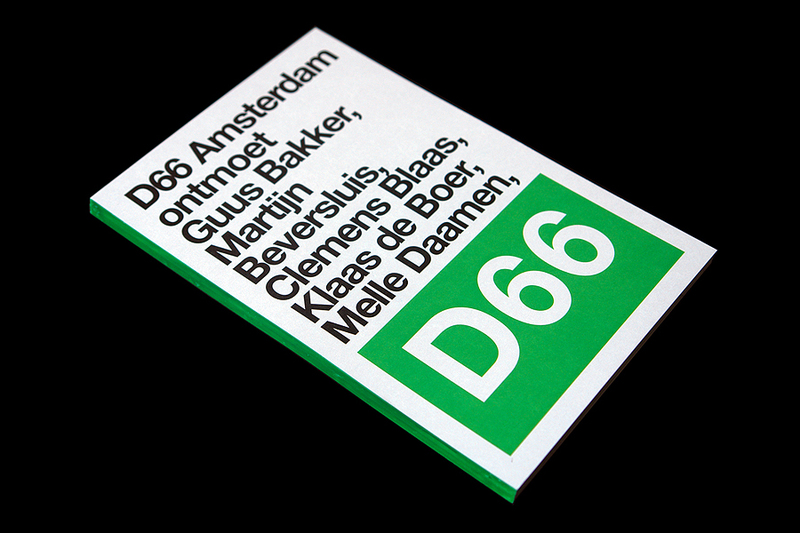 Flyers accompanying the D66 Poster-series. Gay Yes!, Nightlife Yes! and Study Yes!. 2009. Visual Identity at G2K, Amsterdam. 2008. 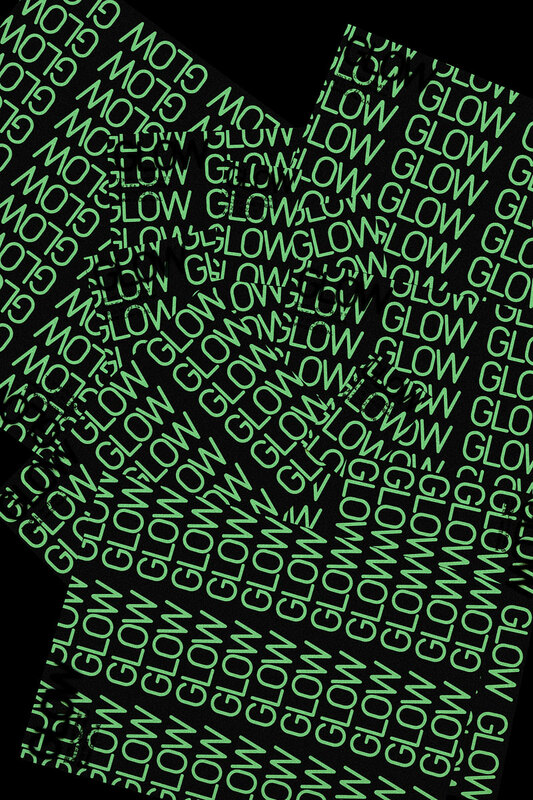 The identity unveils it’s true-colors at night, when the glow-in-the-dark-ink lightens up. Event-design at G2K, Amsterdam. 2009. 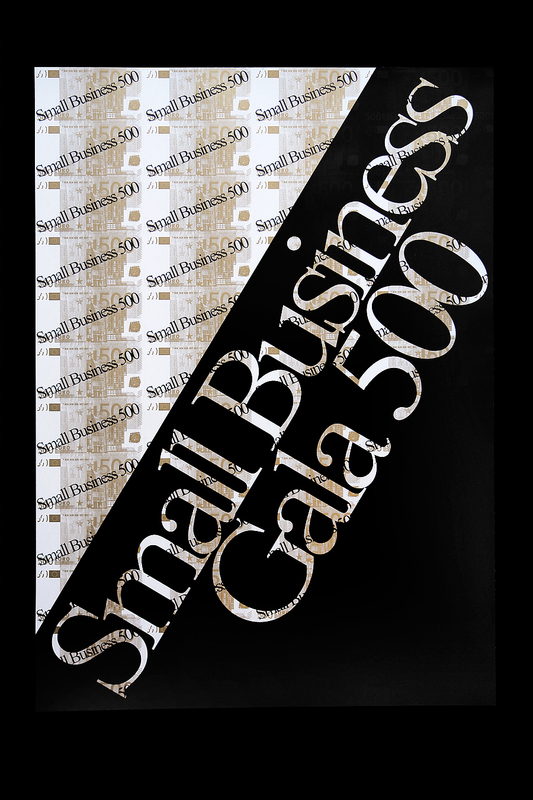 Wallpaper for a gala-reunion of Small Business Students in Haarlem, The Netherlands. 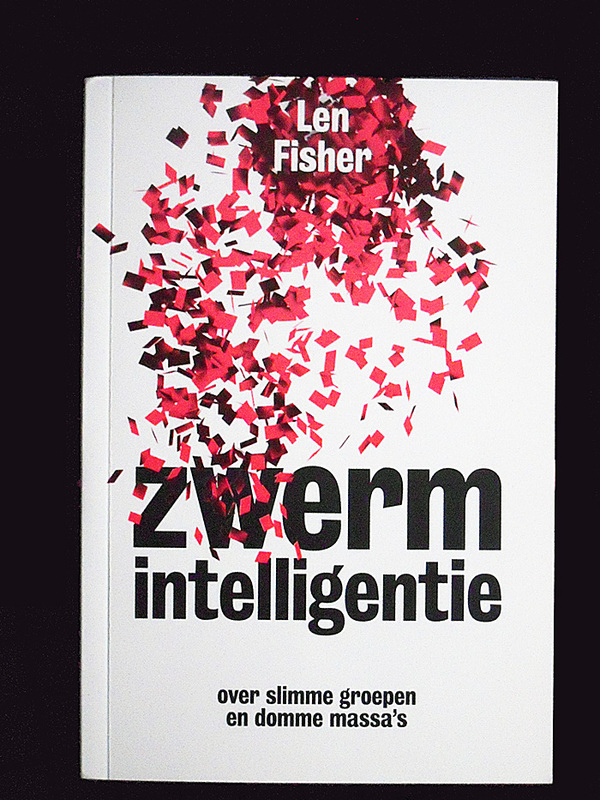 Book design at G2K, Amsterdam. 2010. Part of the Visual Identity for Maven Publishing. 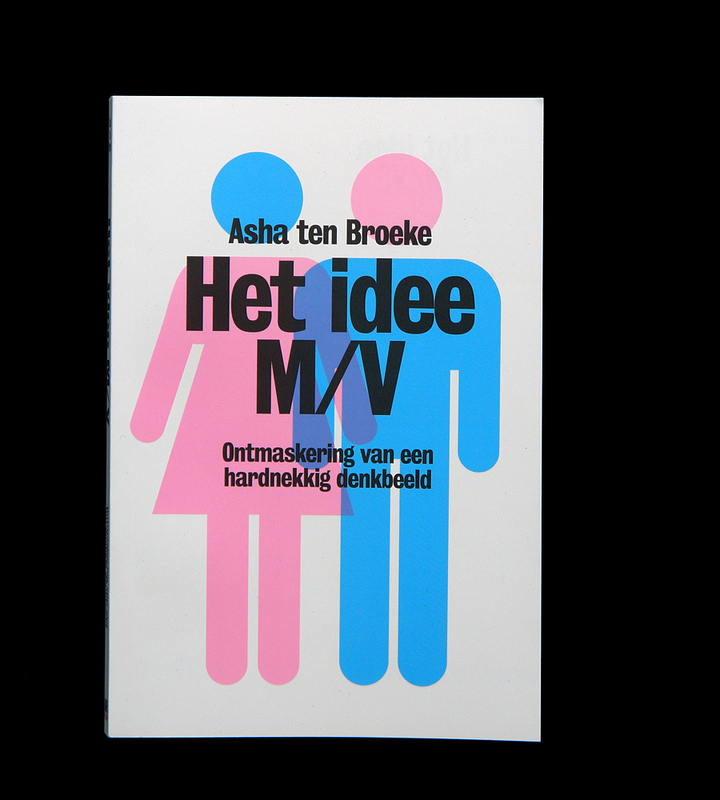 Het idee M/V / The M/F concept. In short and humorous anecdotes Asha counters the popular theories of ‘men are from mars, women are from venus’ as nothing but old prejudices wrapped as modern insight. Her conclusions are both confronting and inspiring: the latest developments in genetics and brainscience shows that man-woman-differences are not a part of our genetics but re-created within every new generation. Visual Identity at G2K, Amsterdam. 2009 — 10. All the design-work for Maven has been awarded with a ‘Red Dot Design Award 2010’. 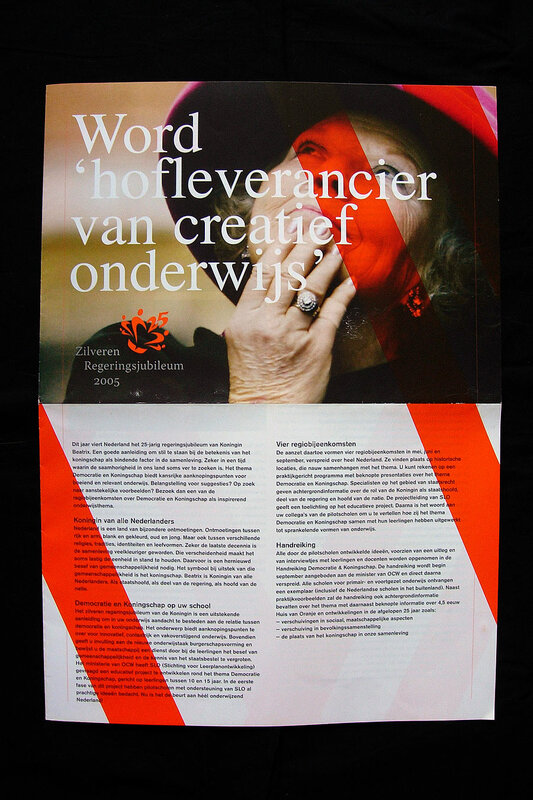 Brochure design at G2K, Amsterdam. 2008. ‘Land in sight!’. ‘Houthaven’, an Amsterdam area under construction; living & working. The design is based on the very visual metaphor of looking through binoculars towards undiscovered land. Visual Identity at G2K, Amsterdam. 2009. 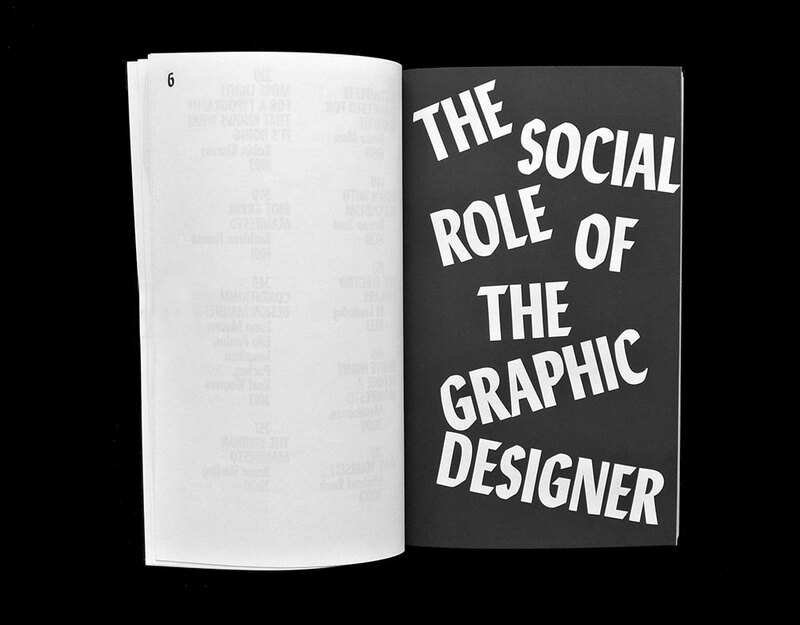 Book design at G2K, Amsterdam. 2010. Part of the Visual Identity for Maven Publishing. 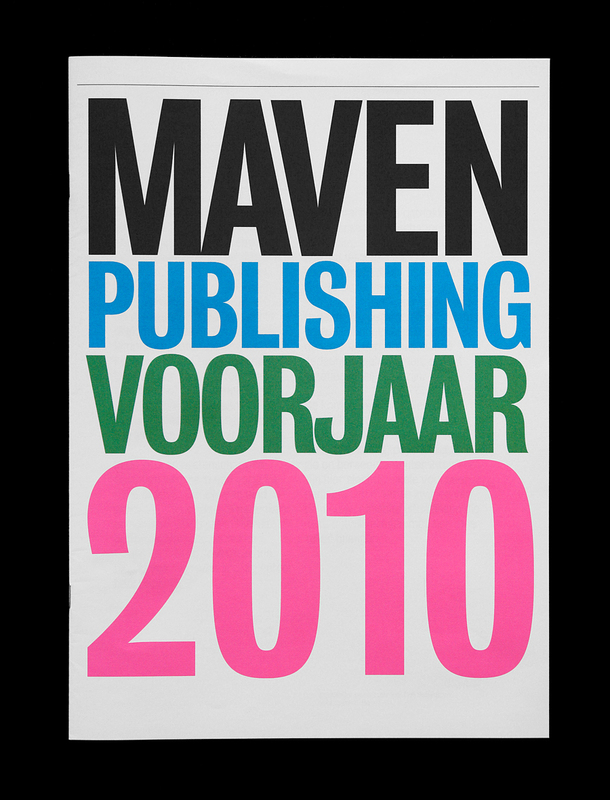 The first title of the new publishing house ‘Maven Publishing’. 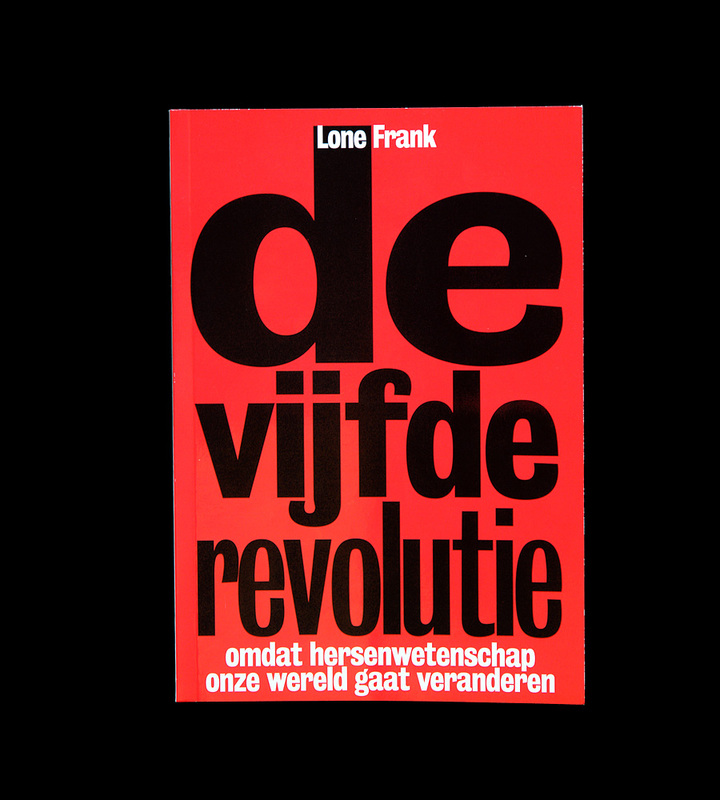 ‘De vijfde Revolutie’ by Lone Frank focusses on the fifth revolution in science: after Copernicus’ universe, Darwins Evolution Theory, Freuds Observation of the human mind and Watson/Crick’s DNA Helix, the new science is that of the brain. 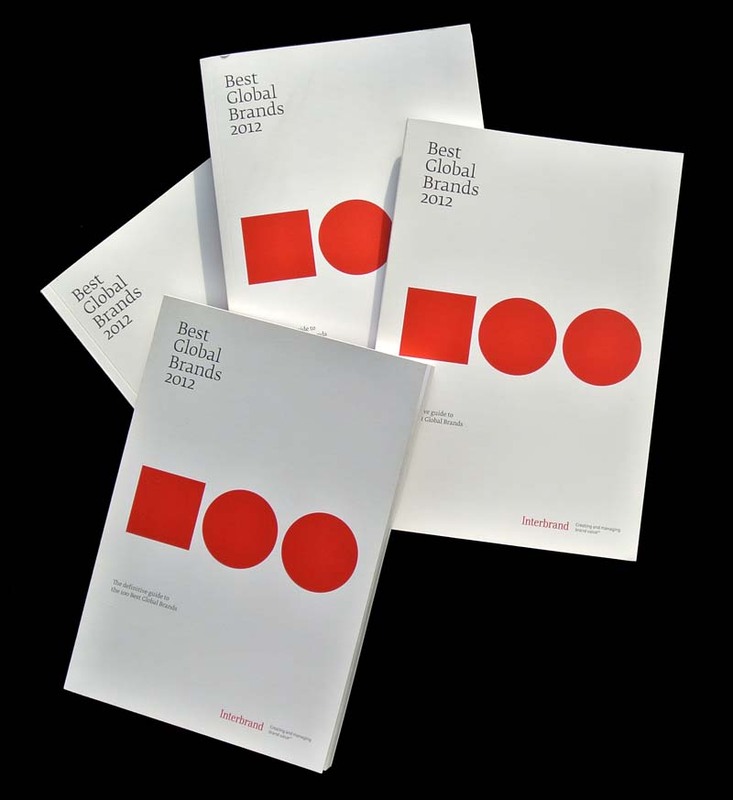 All the design-work for Maven has been awarded with a ‘Red Dot Design Award 2010’. Type design at G2K, Amsterdam. 2008. 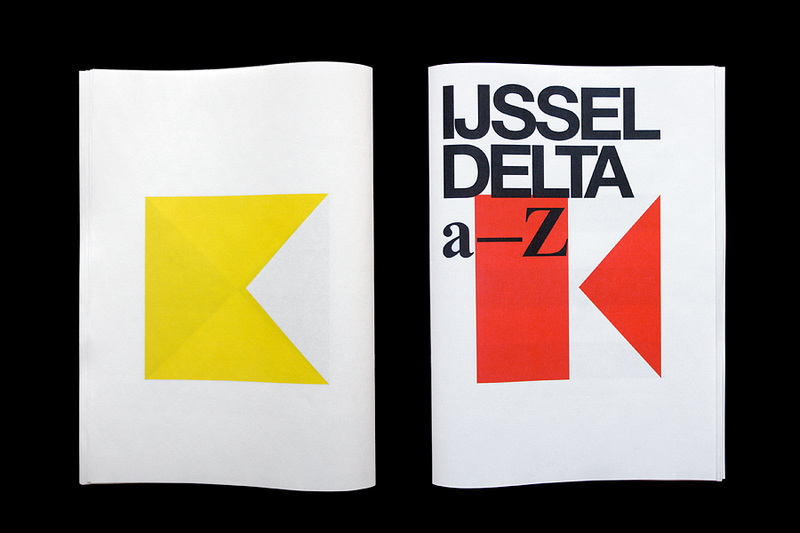 The underlying graphical alphabet, used for the visual identity of the IJsseldelta. 2 times 26 letters makes 52 pages. 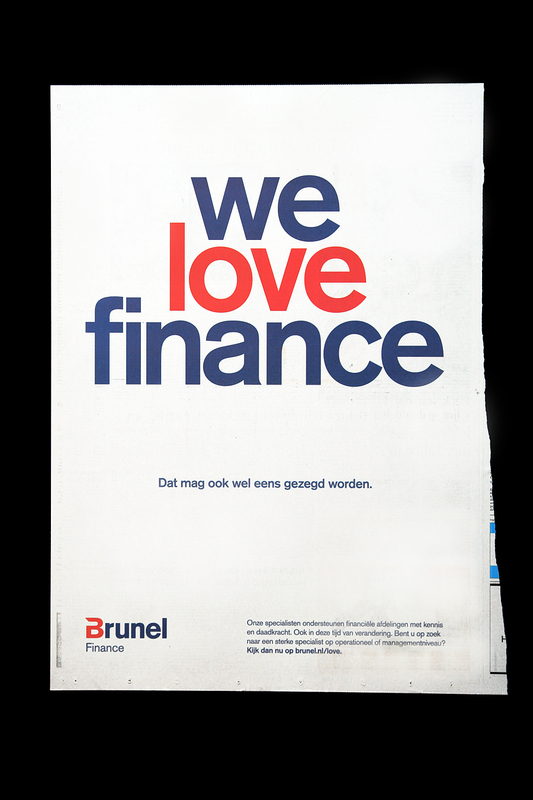 Brochure/Art direction for Brunel (International), at G2K, 2009/2010. With custom aerial photography on the spot, showing locations of operations for Brunel. Photography: Marco van Middelkoop. Research. 2009/2010. 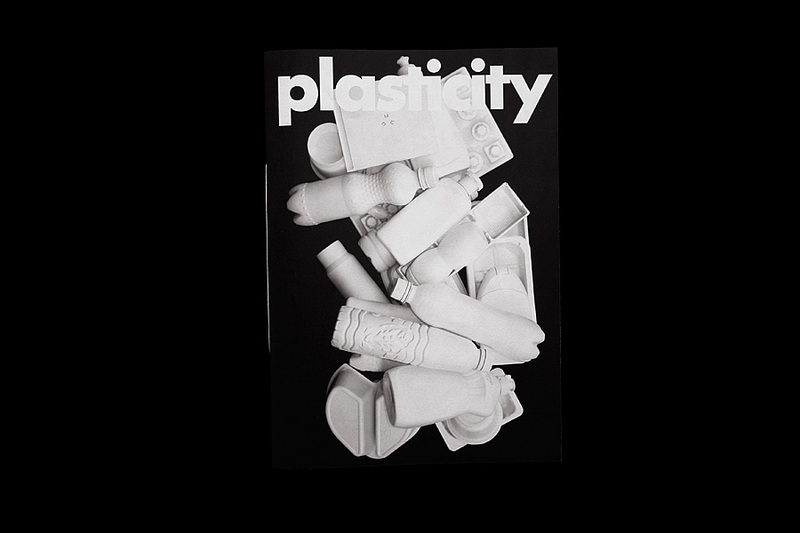 Detached from habitat and uncovered of their smiling messages, these ‘plastiques’ transform into a anonymous collection of shapes and mass withholding their original purpose; what’s left is a almost ‘typographic’ series of seemingly well-familiar objects. Positive/Diapositive. Research at G2K, Amsterdam. 2008. 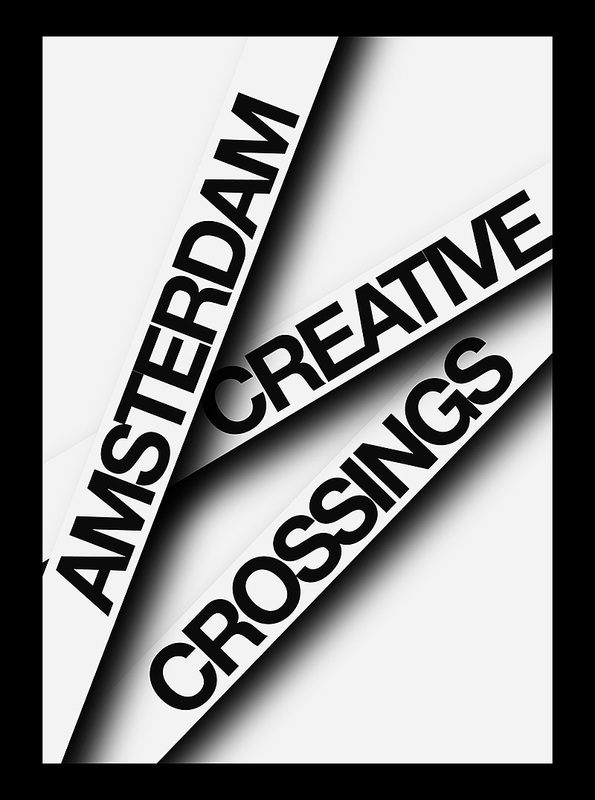 Small visual-research-document on the identity for Amsterdam Creative Crossings: A spiderweb-esque structure in which the ‘logo’ isn’t fixed, but acts as a dynamic interface; symbolizing the intention of ACC: establishing (side)connections between business and culture. 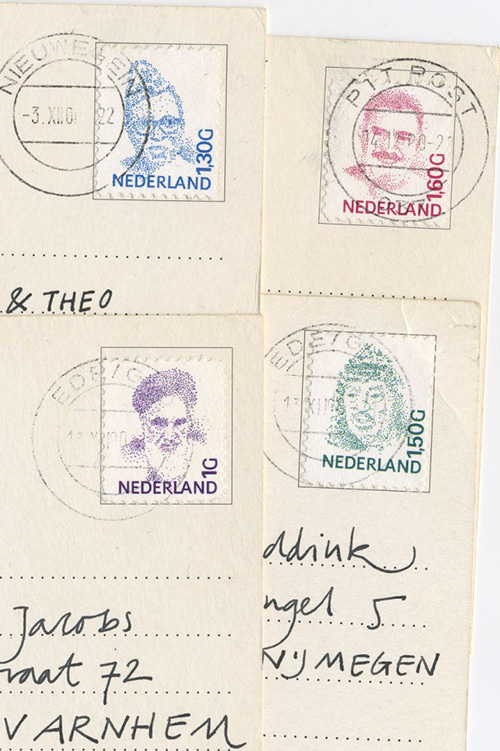 Post stamps, in which the style of the Dutch stamps of Peter Struijcken is used to tell a new story. The portrait of Queen Beatrix is replaced by those of several dubious world leaders. Rebel-leader of the Kurdish Abdullah Öcalan, President Mobutu of Zaire, Yassar Arafat, leader of the Palestinians and Ayatollah Khomeini, spiritual leader of Iran. 2000. Term paper Graduation. 2002. Executed on actual newspaper size (DIN A2). 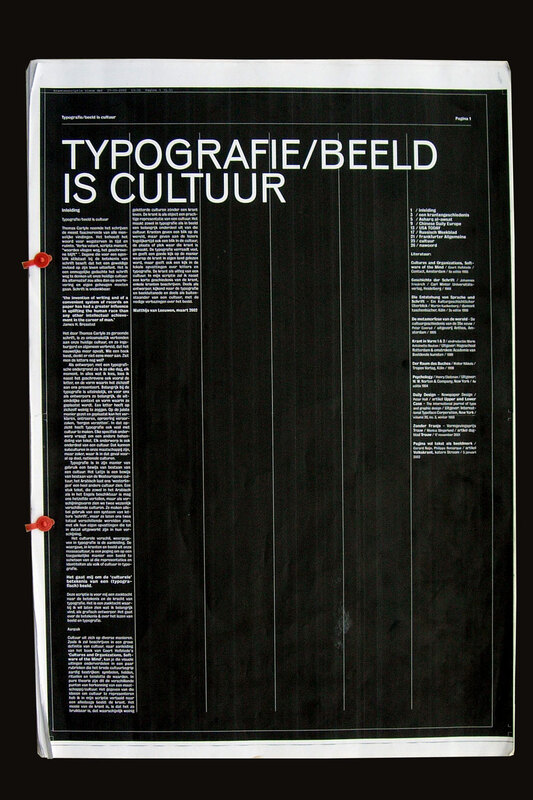 The term paper researches cultural/typographical qualities in newspaper design. The newspaper as cultural phenomenon and blueprint of a culture. 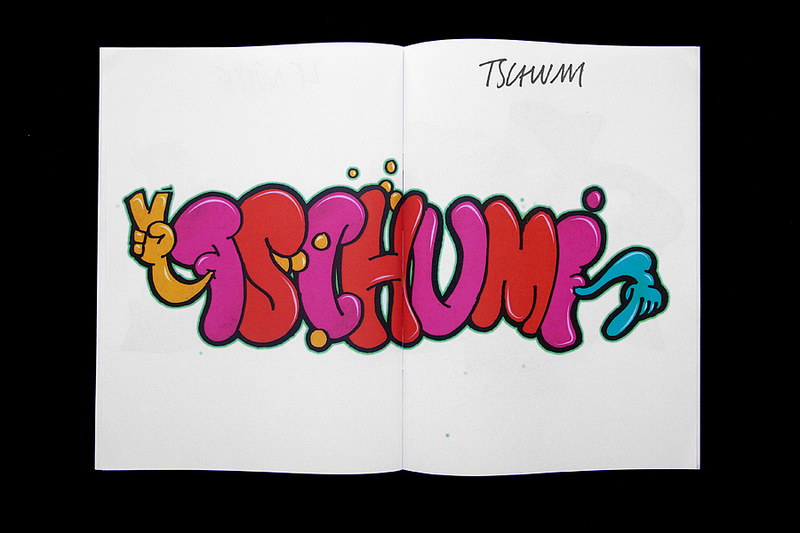 Type design, Graffiti. 2007/2009. Urban graffiti meets Theory on Urbanity and Public Space. First version created during Logo Parc, finished in 2009. The anonymous tags and graffiti are replaced by the names of philosophers, politicians and architects reflecting on Urbanity and Public Space, who in themselves become anonymous and encrypted again. As a contrast to street vs. theory. Alain Badiou, Chantal Mouffe, Bernard Tschumi, André le Nôtre, Francois Mitterrand etc. 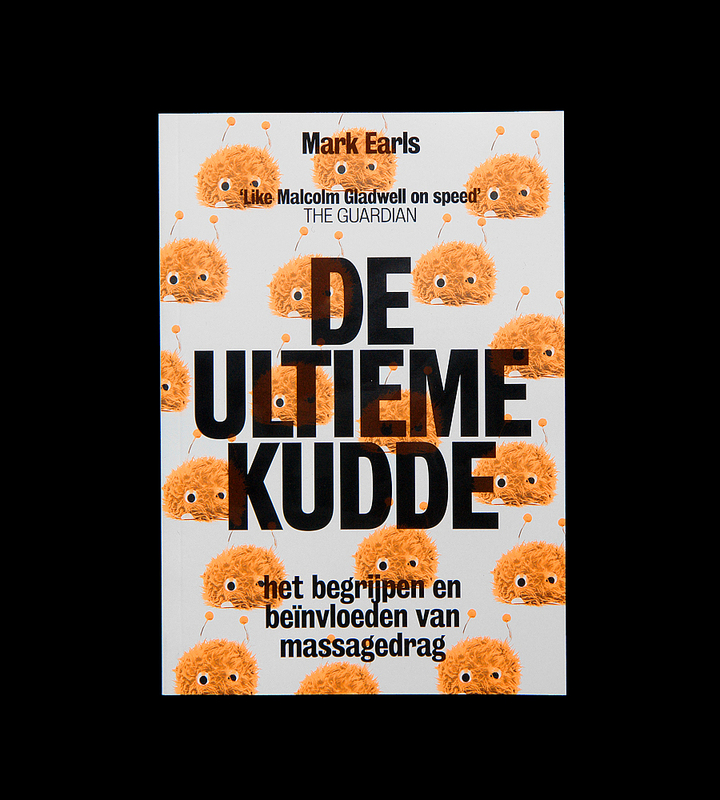 Book/Magazine design, In collaboration with Floor van Essen. 2001. 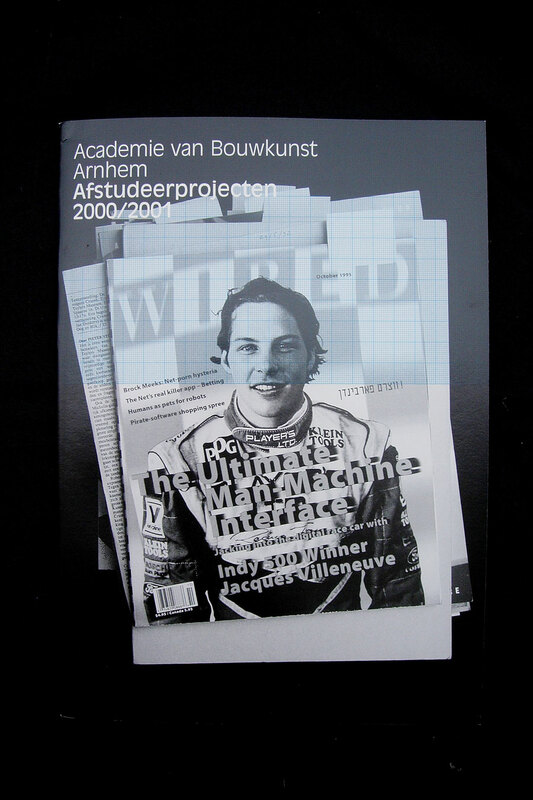 Indexnumber ‘Tien Jaar de Kunsten’, magazine of the HkA (now Artez). 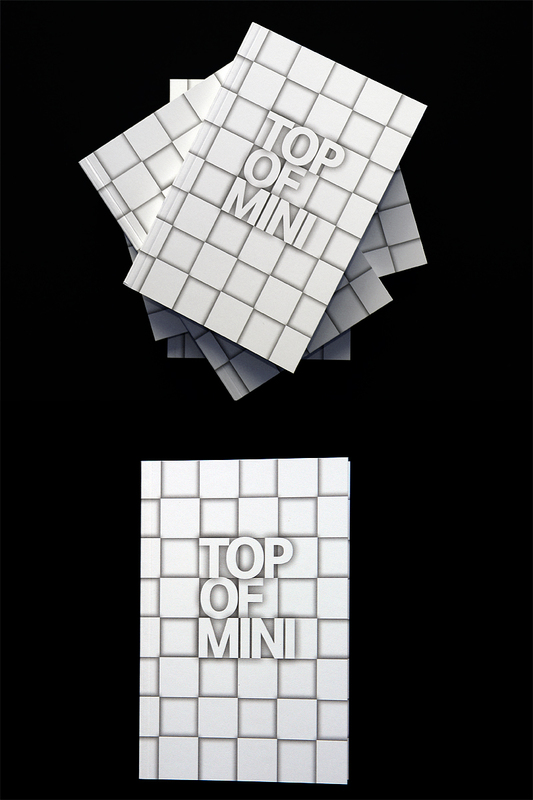 Corporate Identity-Design within an existing framework for the SLO. In collaboration with Gerco Hiddink. 2004-2006. Visual identity, in collaboration with Gerco Hiddink. 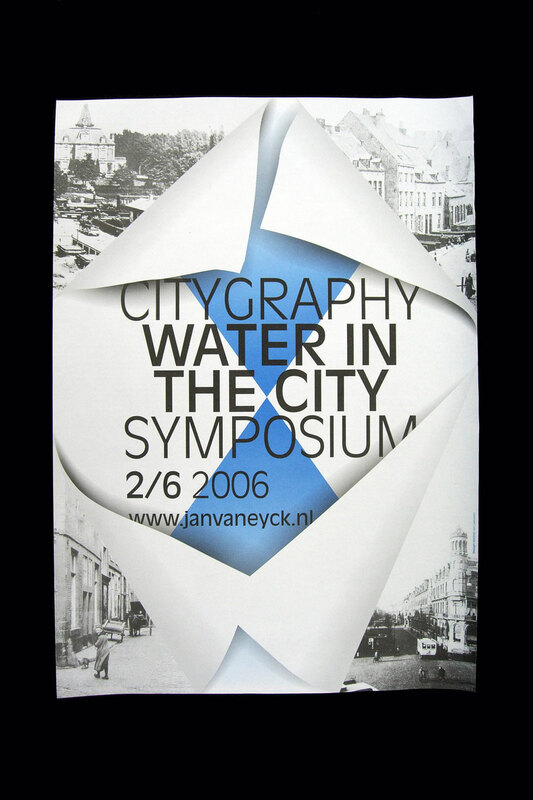 for ‘CityJam’, a project by Hooghuis, Arnhem, The Netherlands. The identity is formed by a collection of images brought together on an associative base. Some are directly related, others with the blink of an eye. 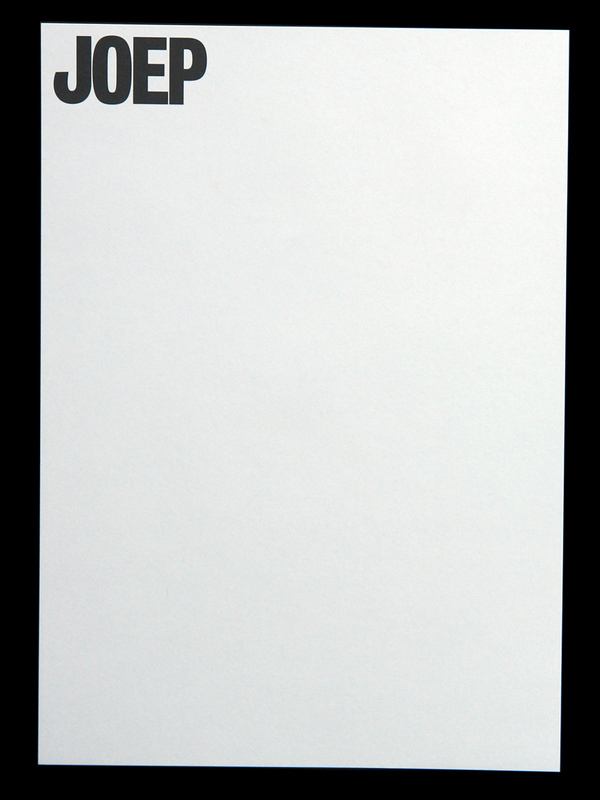 The A2-poster can be printed directly, but is also designed with the possibility to be cut up in four pieces. Each piece (A4) tells a part of the bigger story. These pages can be used as stationary. Maximum effect is created by the use of Neon colors. 2004. 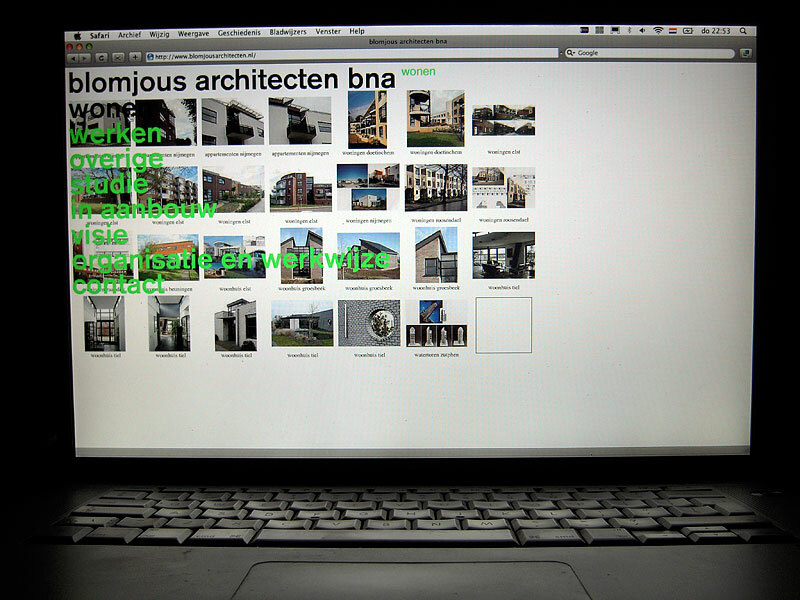 Website design for Blomjous Architects bna. The Netherlands. *2004 †2010. In collaboration with Gerco Hiddink. 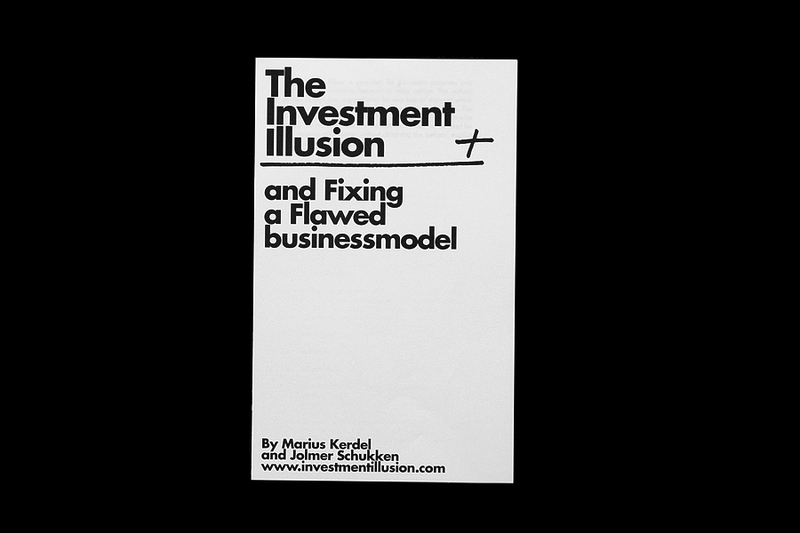 Book/Magazine design. 2002. The content of the catalogue, the student-projects, are placed in a broader cultural frame, which contextualize the projects. The frame creates an extra editorial layer within the design. 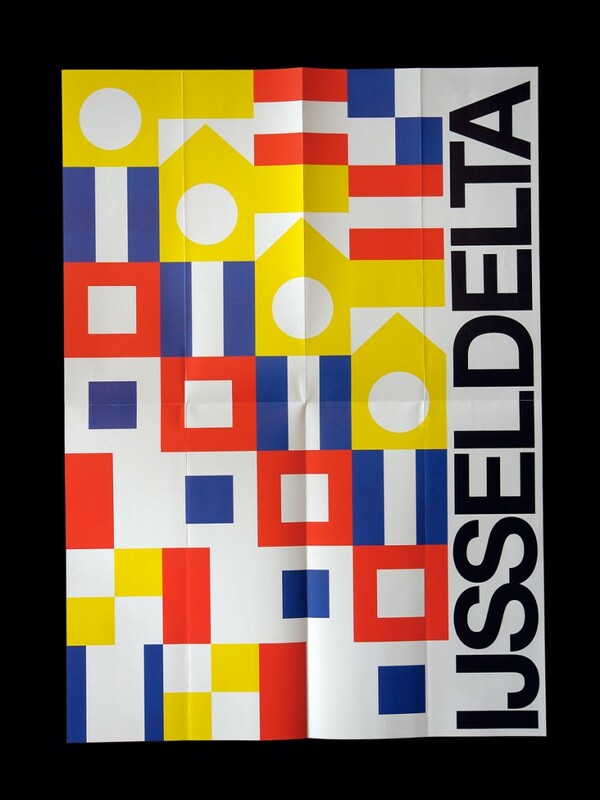 Poster design at the Jan van Eyck, Maastricht. 2006. 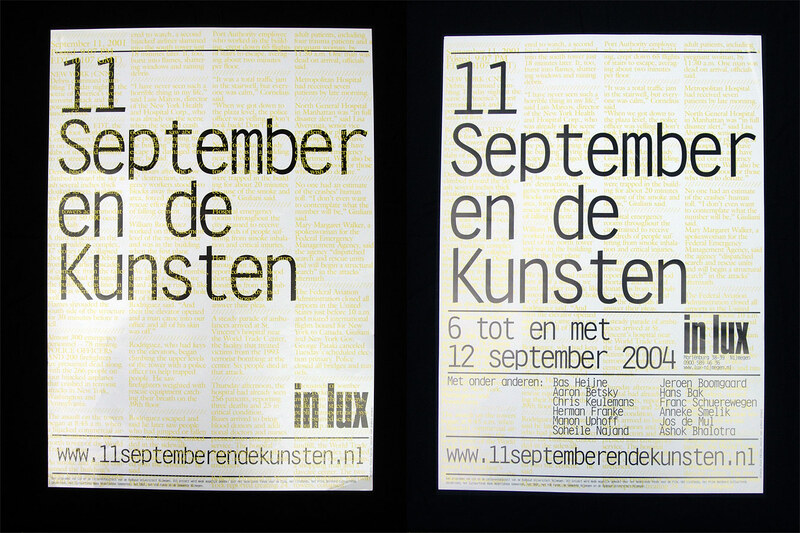 Posterdesign at the Jan van Eyck, Maastricht, Amsterdam. 2007. 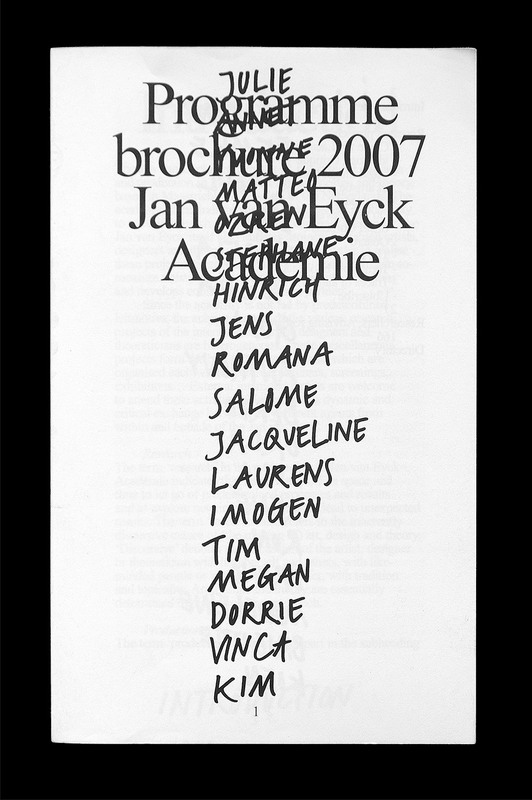 Poster design for the Jan van Eyck, Maastricht. 2006. Campaign design at the Jan van Eyck, Maastricht. 2007. Subject: (Re)search. In collaboration with photographer Jean-Baptiste Maitre. 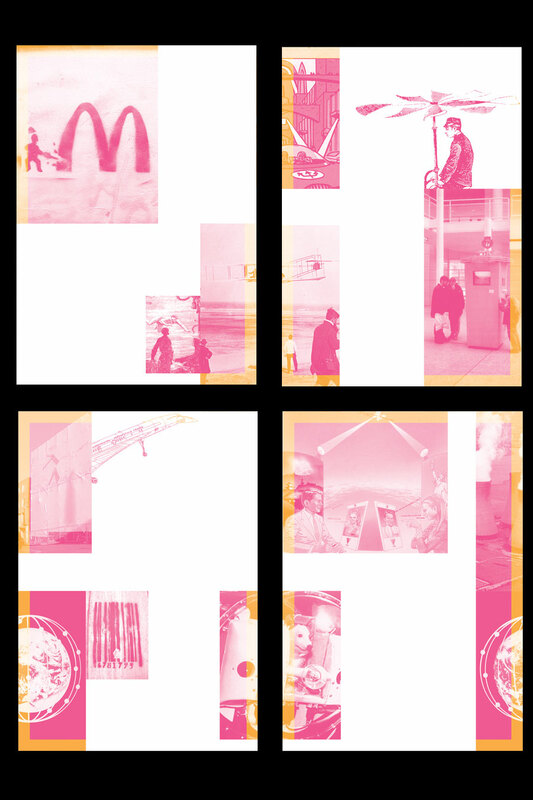 Visual Identity for a six-day debate on the influences of 9/11 on art and design. In collaboration with Gerco Hiddink. 2004. Underneath the information-layer lies a ‘live’ CNN-NEWS-stream from during the disaster. 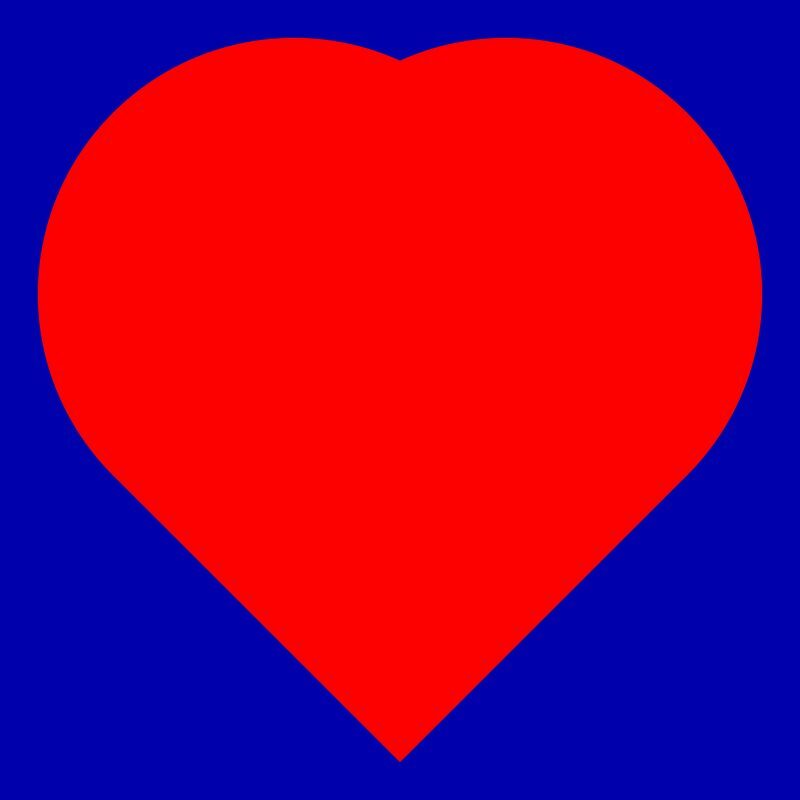 Within the website this layer is animated. Typography is set in IBM Orator, a classic matrix typeface. 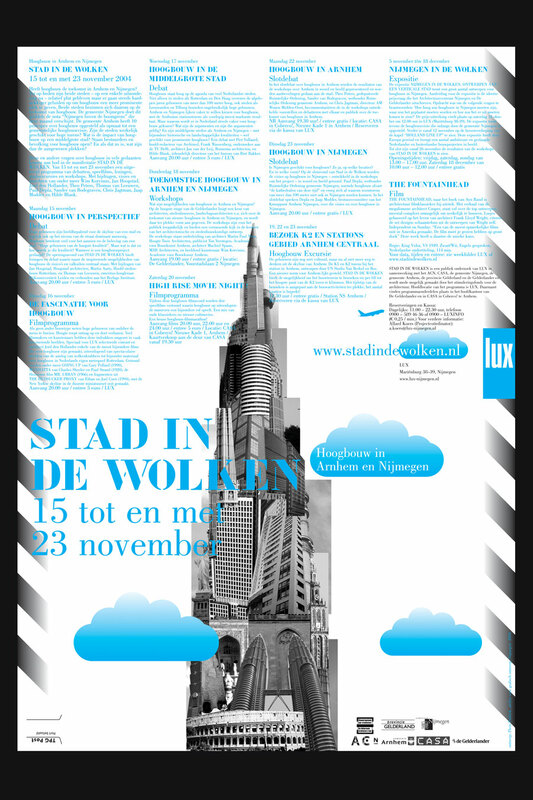 ‘Stad in de Wolken’ is a series of debates by the stage LUX in Nijmegen. In this debate high-rise building is discussed in the region Arnhem-Nijmegen. (KAN-Area). We created an image referring to ‘The Tower of Babylon’. An accumulation of designs from the international ‘architectural discours’ form the ultimate architectural design. 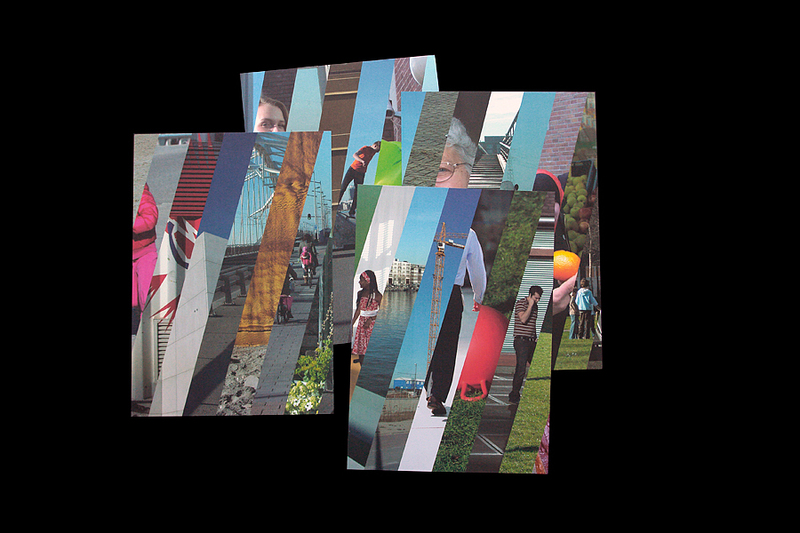 Within the design of the website parts of the collage interact in a playful way with the cursor. 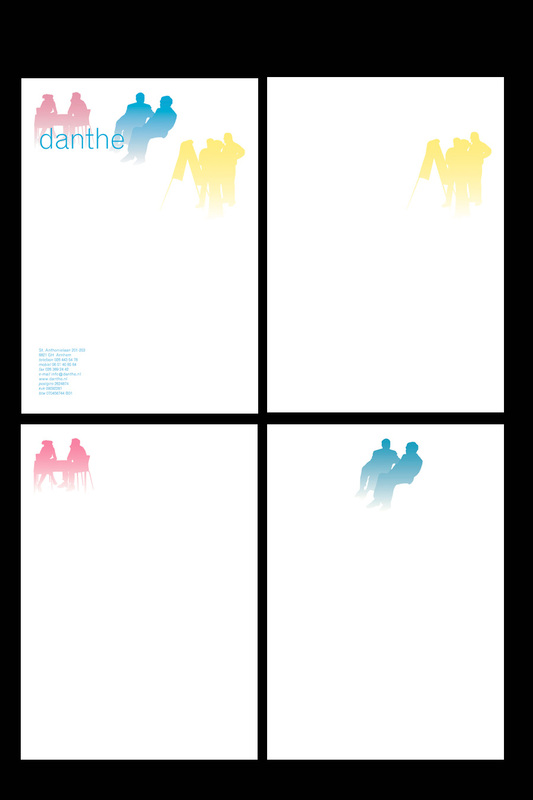 Visual Identity, in collaboration with Gerco Hiddink for danthe.nl. 2004-2006. 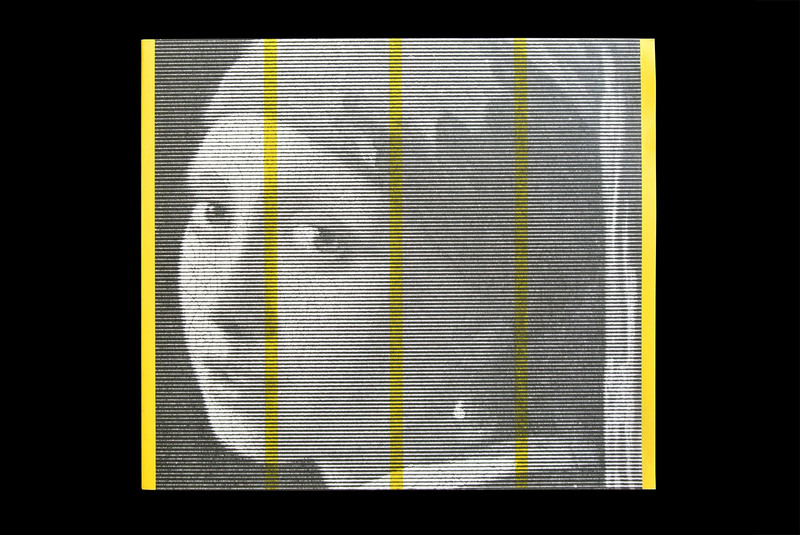 Graphic contours from actual ‘situations’ in the Danthe-trainings are used for the identity. Advertisements HkA. (Artez Academy, Arnhem, The Netherlands). Music, Drama, Dans, Art & Design and Architecture. 2002. 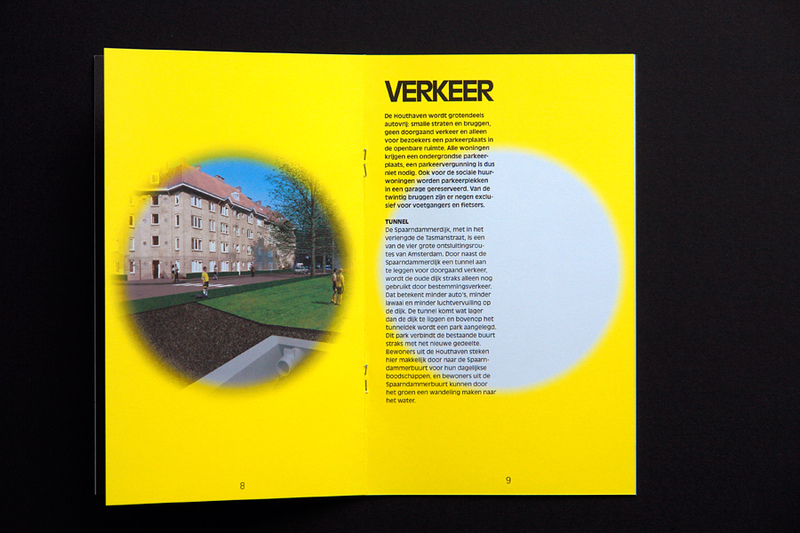 Brochure and Book design, in collaboration with Gerco Hiddink. 2005. Website design with Maarten Verweij. 2001. Commissioned by Felix Janssens and the Observatorium. (Foundation for the arts. 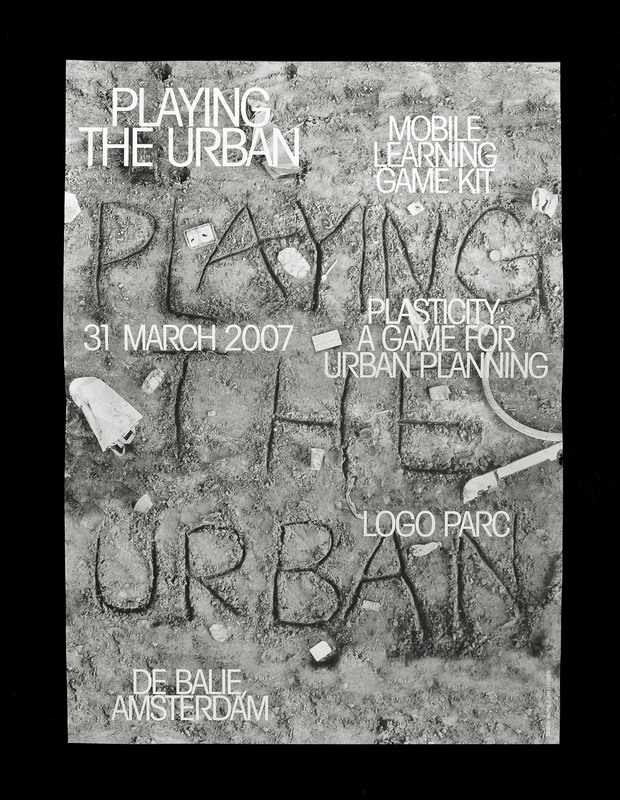 Developing Art projects in relation to urban planning and landscape.) Main function of the website is that of archive. 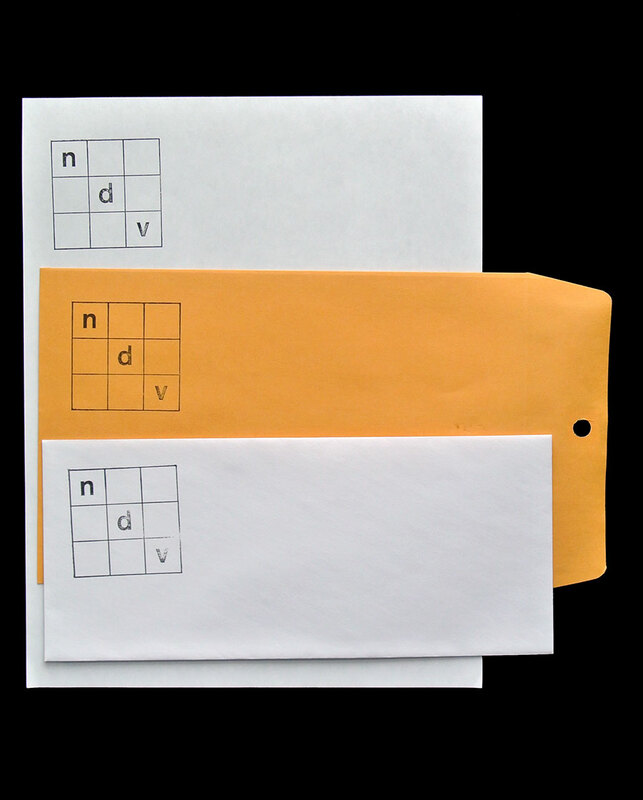 The design moves around a ‘simple’ but effective 3×3 grid in which all information can be obtained. 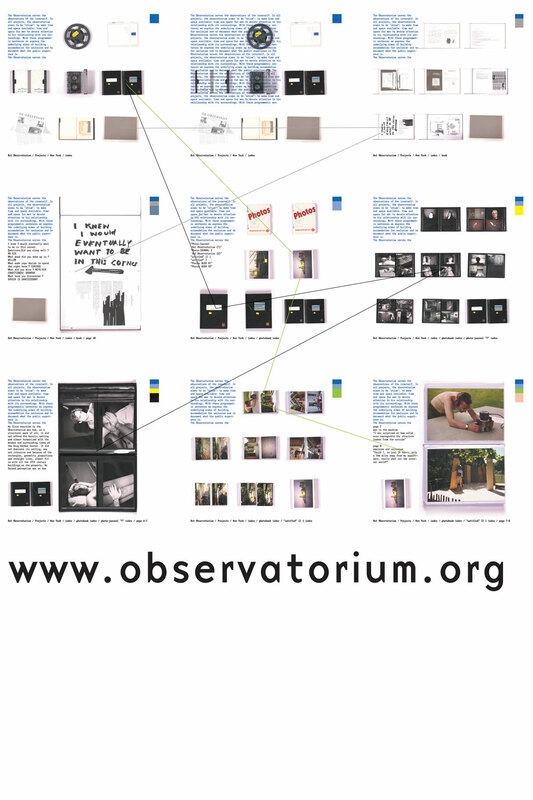 Important aspect is that the ‘photographed’ archive at the same time functions as site-navigation. Certain objects like filmrol, script, photo and scrapbook function as main theme headers. Searching in this way for information becomes like a ‘unguided missile’; no idea where you’ll end up. Unexpected confrontations.